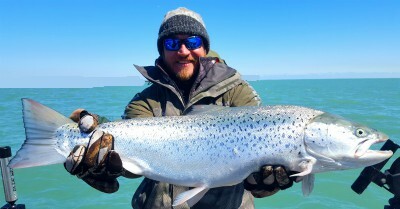 If your looking for all the details that make the big difference on the water and want to learn from some of Lake Michigan's best fisherman take a look at the link below. 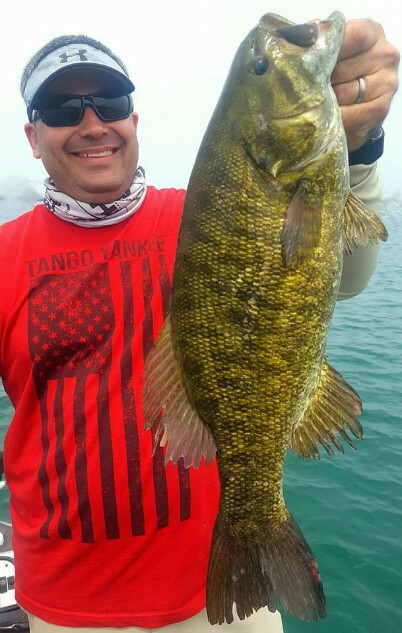 Plus some great deals on custom tackle used on my boat. I am PROUD to be part of this. 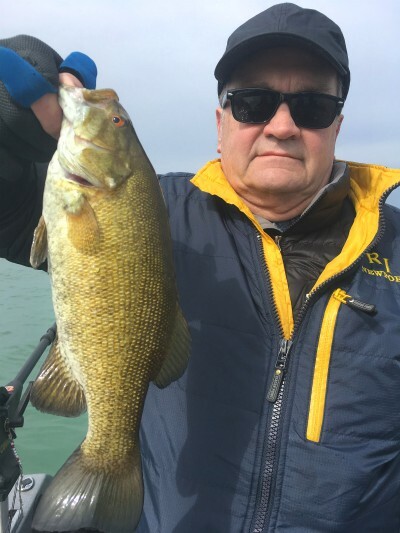 11-1-18 thru 11-26-18 Great Fishing! 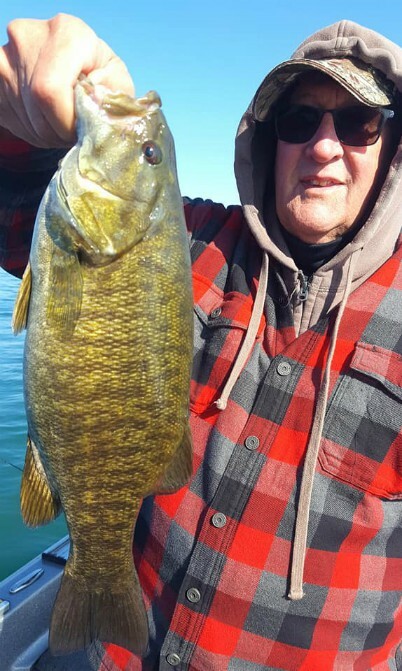 November has been pretty good to us both for fishing and for weather. We have still had to fight the weather non-stop but at least it has been giving us a fighting chance. 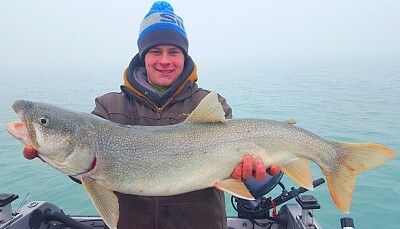 Fishing for big lake trout has been excellent, huge fish and big numbers daily. 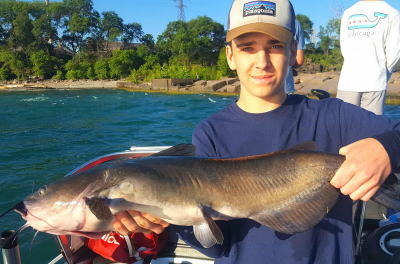 All our fishing has been done fishing 10 to 40 ft of water jigging a mixture of blade baits, jigging spoons, and some other jigging baits. 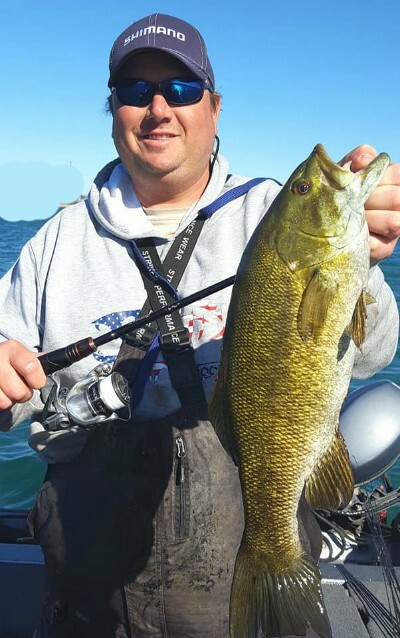 We have been using Shimano Stradic FK 3000 sized reels with 10lb braided line with Shimano Zodias 7'3 MH spinning rods. 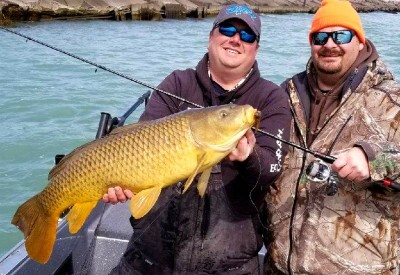 Talk about some hard fighting fish on light gear, they go nuts! 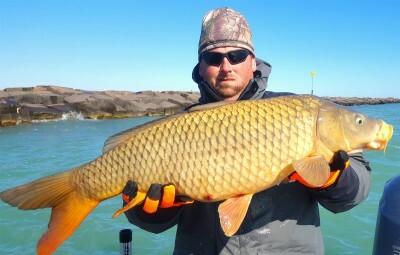 Good news is this style of fishing will continue thru the winter and into early March. 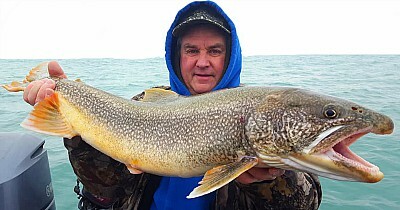 If your interested in big fish on light gear give me a call. Also spring dates are filling up faster than ever, don't wait to book your days. 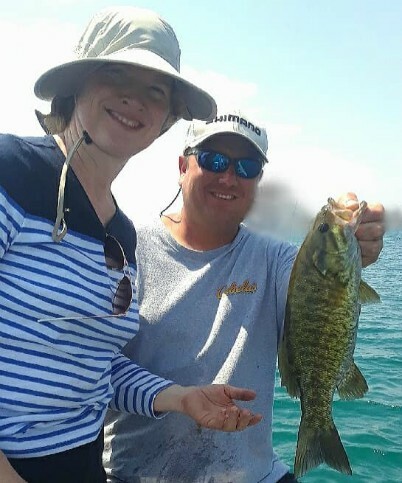 Call me soon if you plan on fishing in spring with me. Couple side notes. Yes, the rainbow picture below is completely real! It formed right over our heads, I have never seen anything like it. 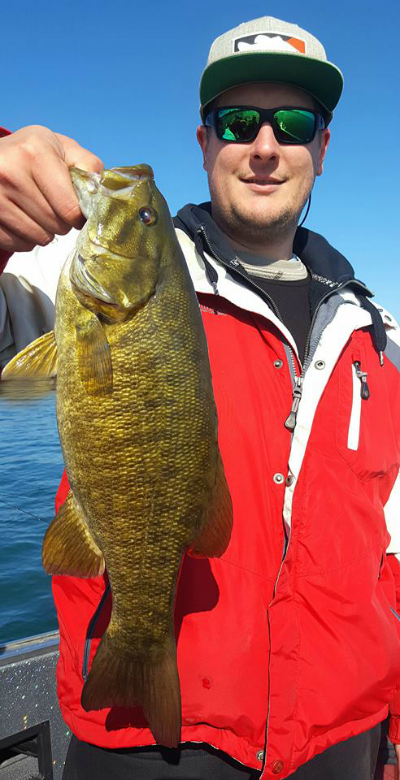 Also we decided to try a very late season smallmouth spot and landed a 5 lb 6 oz. GIANT. 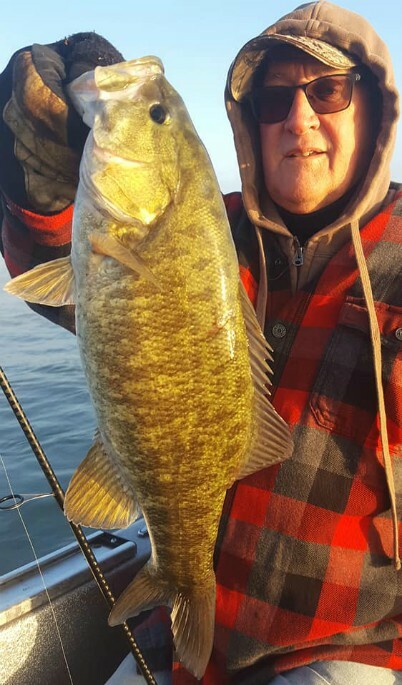 Most likely the last one of the year and it was a horse! Give me a call for trip info. I also have gift certificates available. Good luck and be safe. 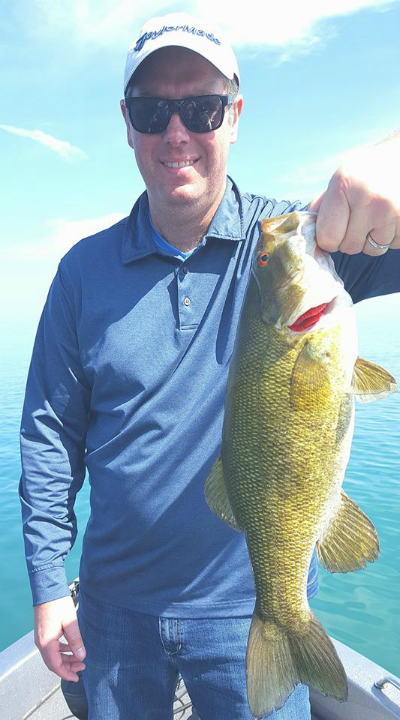 The hardest part I have in guiding on southern Lake Michigan is trying to play the weather. Unfortunately the weather is out of my control. I always put my guests safety and comfort first. 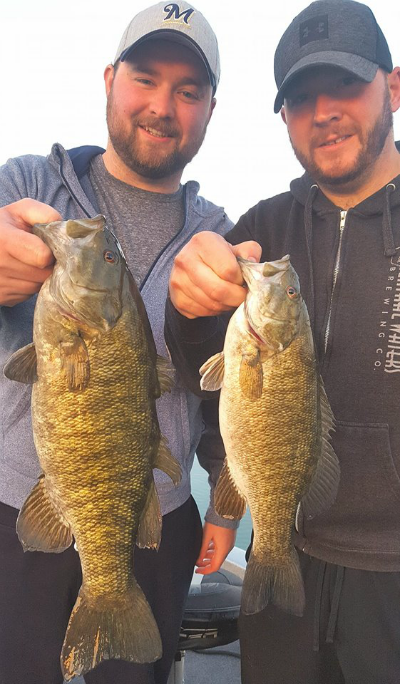 I also want to take them out when I feel we have a good shot at having a good day of fishing. Here was the big problem with September and October this year, the weather, winds, and waves were awful. 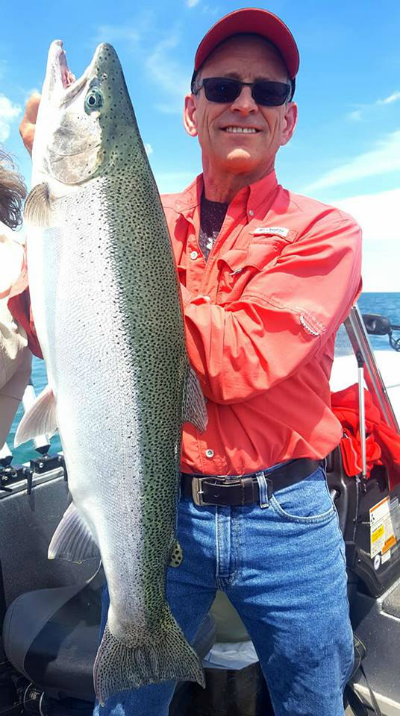 The most frustrating part for me was when we could get out safely fishing was very good, some of the best I saw all year. 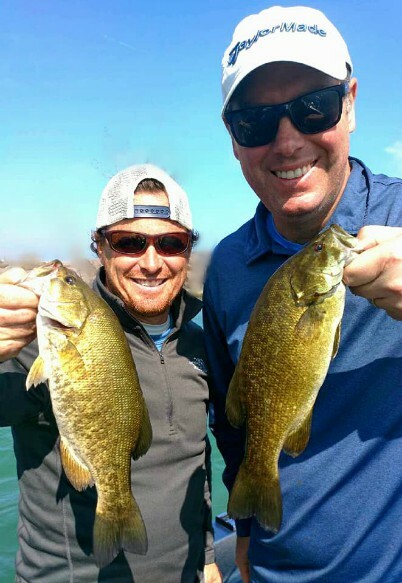 The numbers of smallmouth per trip were outstanding. 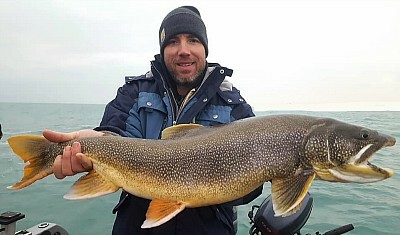 The size of the fish was great too, lots of very nice fish. 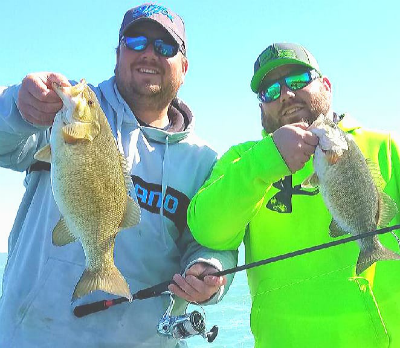 The patterns we used to be successful were all over the place some days the fish were aggressive and we did very well using Jackall Rhythm Wave 3.8 inch swimbaits swimming them over balls of suspended baitfish. 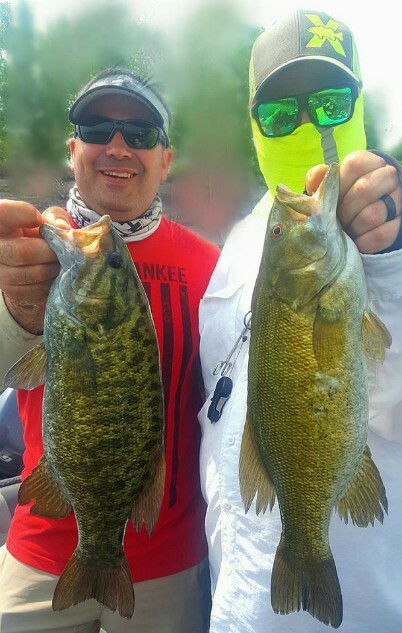 Other days we had to really slow down and fish the bottom with either tube jigs in dark colors or Tight Rope jigs trailered with Lure Craft Little D soft plastics. Again depths of water were all over the place too, anywhere from 6-26 ft of water. 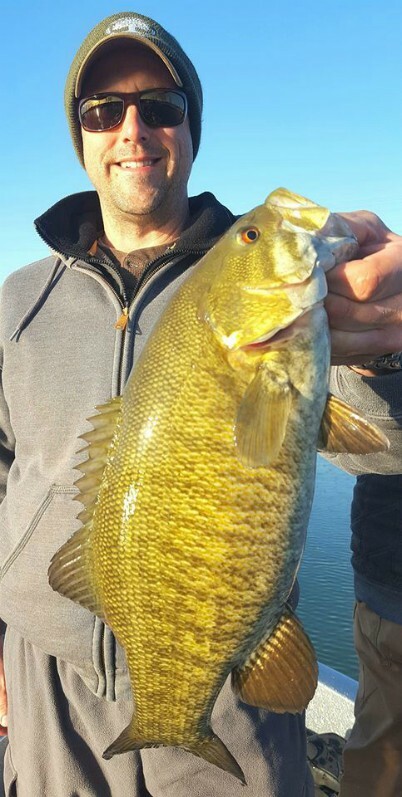 The big surprise for this Fall was the 7 lb 8 oz. 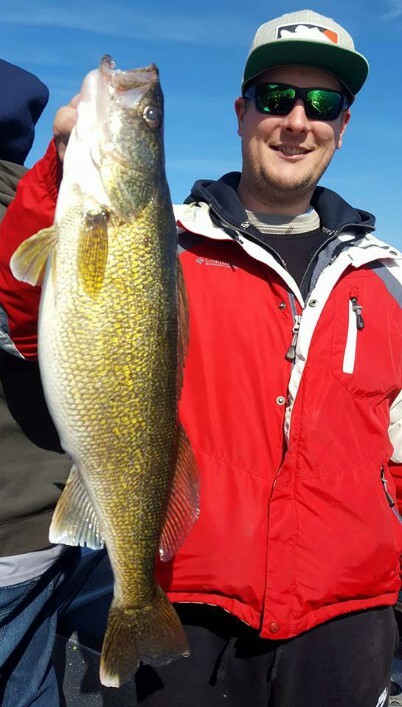 walleye we caught while bass fishing!!! 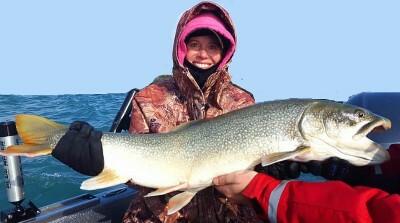 The big walleye was released to fight another day. Picture below. 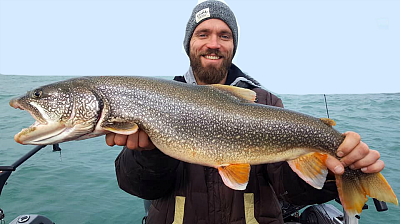 Here's the good news just like always I am very optimistic and I am expecting to have a great November/December/winter jigging for big Lake Trout. I am keeping my fingers crossed for good weather and a mild winter! 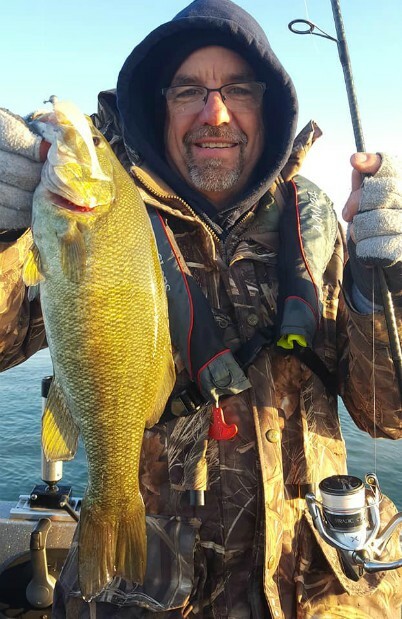 I will continue to fish as long as the weather/ice will allow me too. 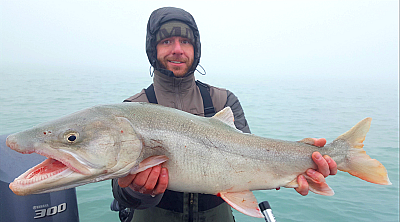 Feel free to give me a call for more info if you are interested in jigging for lake trout through the winter. I am also booking trips for 2019 on a daily basis, don't wait till the last minute to call me dates will be gone. Call me for more info. 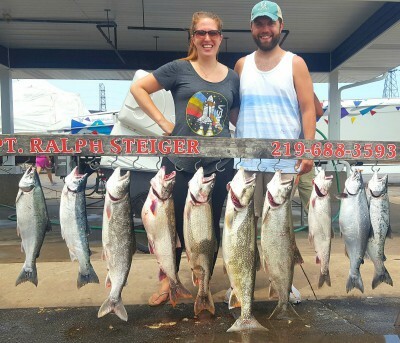 The "Best Fishing Times" page on the side bar will show you a breakdown of what type of trips are offered throughout the year. 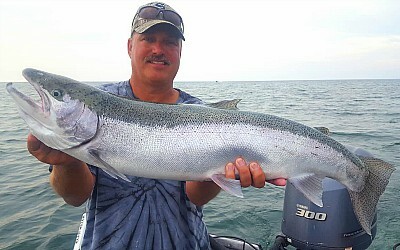 The end of July brought some of the best steelhead trout fishing we have had in the last couple of years. 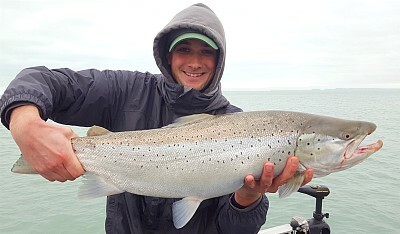 Cooler inshore water temperatures and no rain allowed these fish to stage outside of the river mouths and not run into the rivers right away. 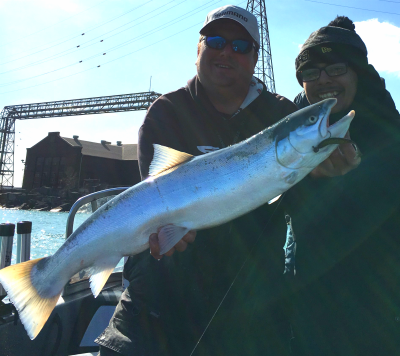 Best part about inshore steelhead fishing is no long runs out to the fishing grounds. 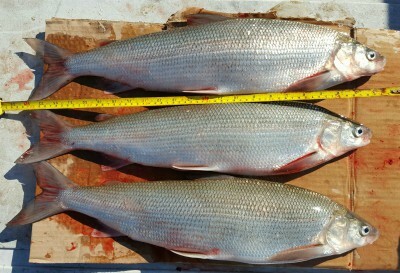 We were fishing along the beaches in about 30-40 ft of water. 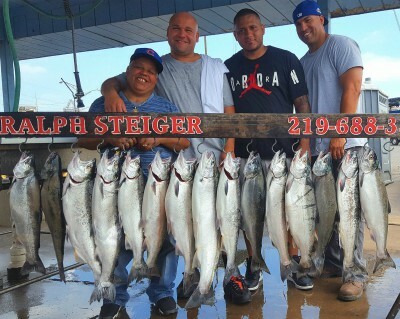 This was some action packed fishing both trolling and casting. 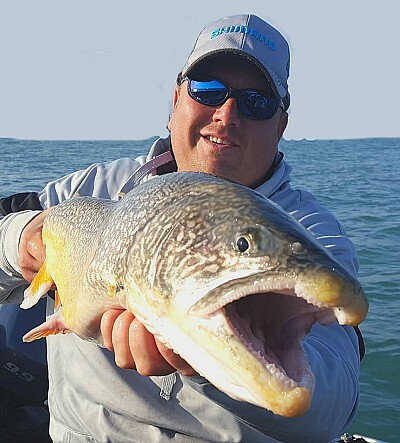 The better fishing was done trolling using magnum Dreamweaver spoons in Candy Apple Red Glow, Fireball, Bumble Bee, Mixed Veggies, UV Goldie Hawn, and Steelie Stomper colors. 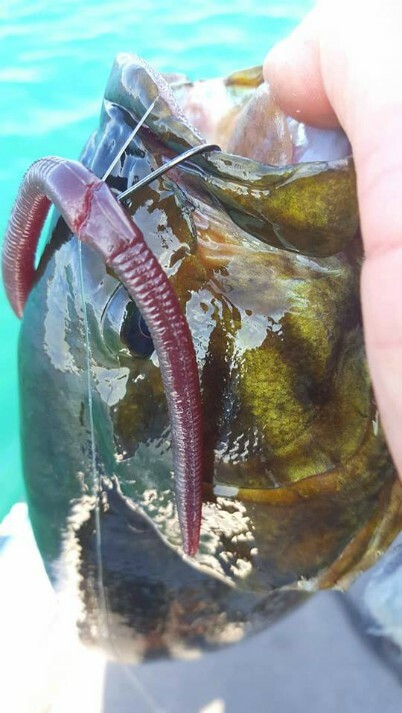 Unfortunately in typically fashion for this style of fishing it was a shortly lived, 1 week bite. 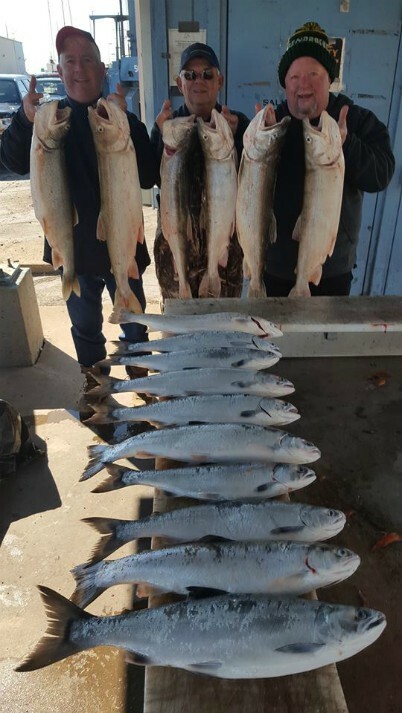 A change in wind direction and a lot of rain sent all these fish right into the rivers. Good new was while it lasted my customers and myself took full advantage of it. 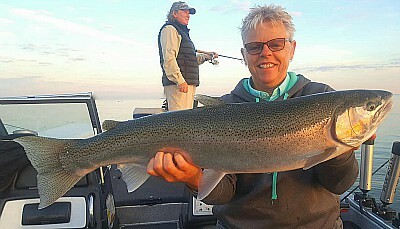 We had some of the largest steelhead I have ever had on my boat including two fish over 17 lbs and lots others a between 14-16 lbs! 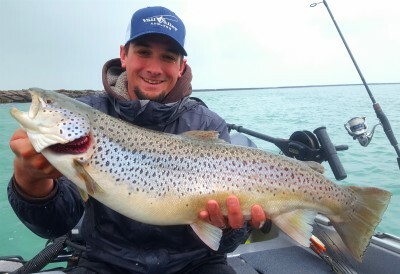 After this bite fell apart we had a stretch of bad weather and heavy North winds which warmed up the water and really made salmon/trout fishing get tough. 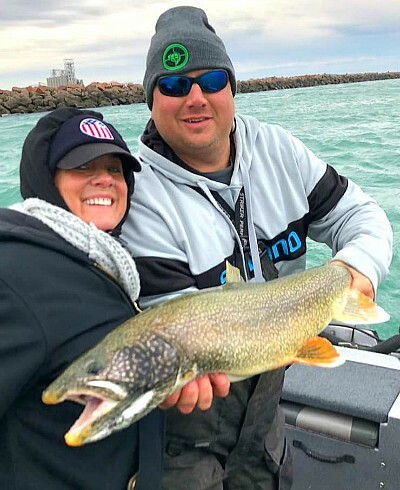 We started fishing 100 to 140 feet of water offshore and it was mostly lake trout with a few salmon mixed in and since early August this has been the pattern. 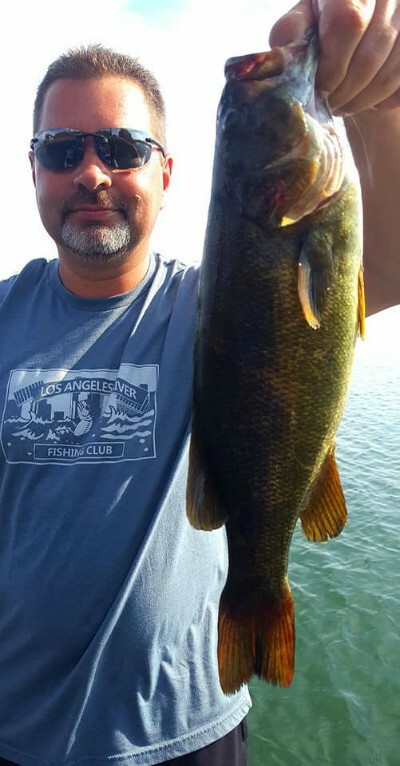 I switched up in mid-August back to bass fishing and fishing was great for numbers of fish with some nicer fish mixed in. 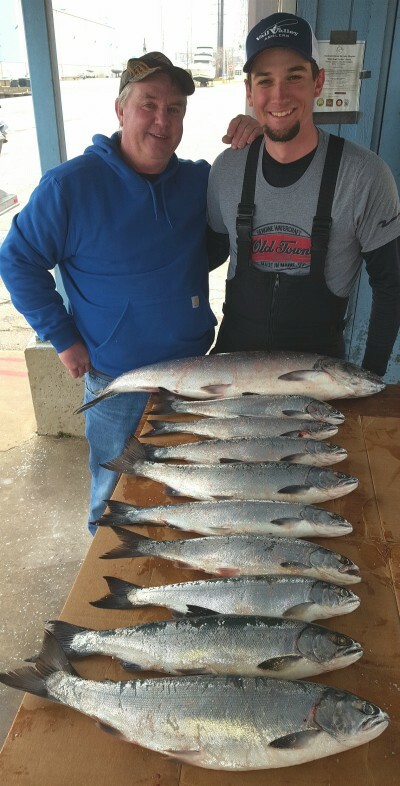 During this time water temperatures were fairly mild for this time of year inshore at around 70-71 degrees. 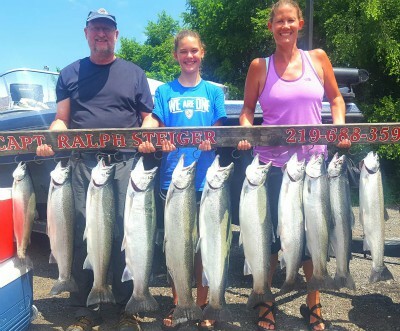 Than about the third week of August water temperatures skyrocketed for about a week to a yearly high 81-82 degrees inshore. 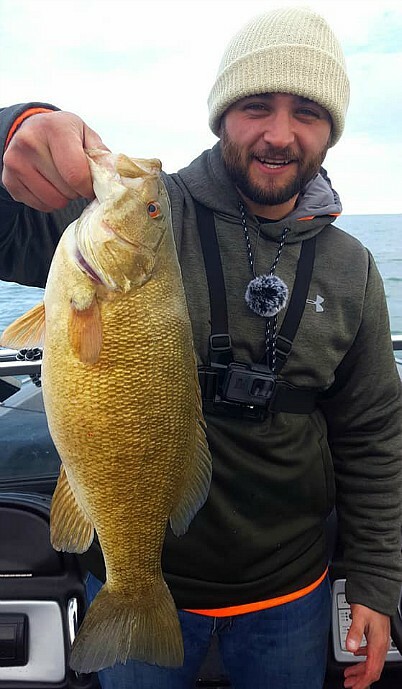 This made smallmouth fishing tough. 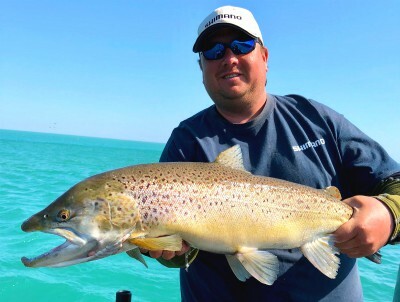 Since than water temperatures have cooled back down into the lower 70's and fishing improved once again. 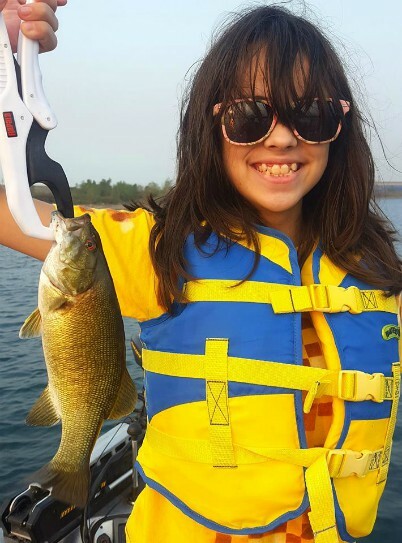 We have been catching fish on a variety of baits. 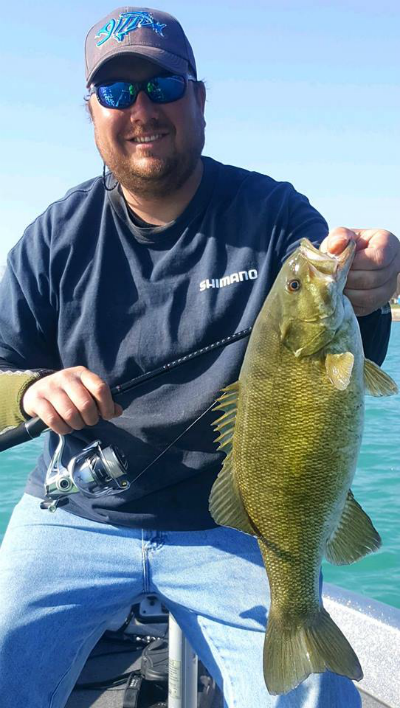 Some of the better options have been Jackall 4.8 Flick Shake worms on a drop shot rigged wacky style, a mixture of tube jigs, and Tight Rope Jigs with Lure Craft Little D's as trailers. 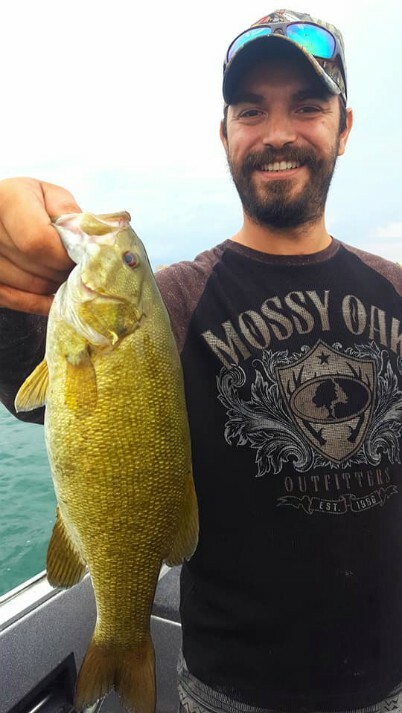 Everyday bait choice has been different just keep mixing it up till you see what the fish are more interested in. 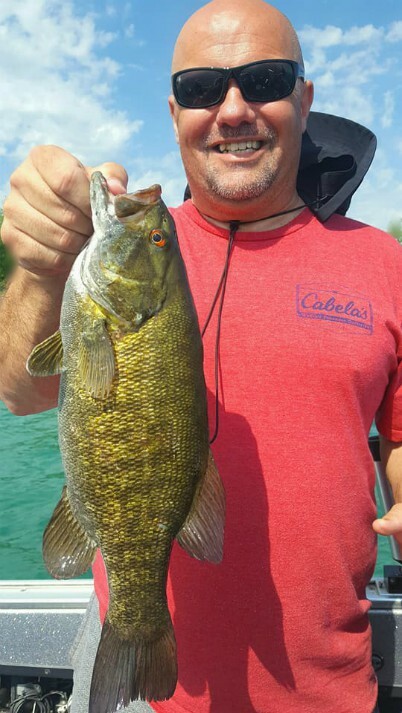 I have a had a bunch of people as about what gear we are using for smallmouth fishing. 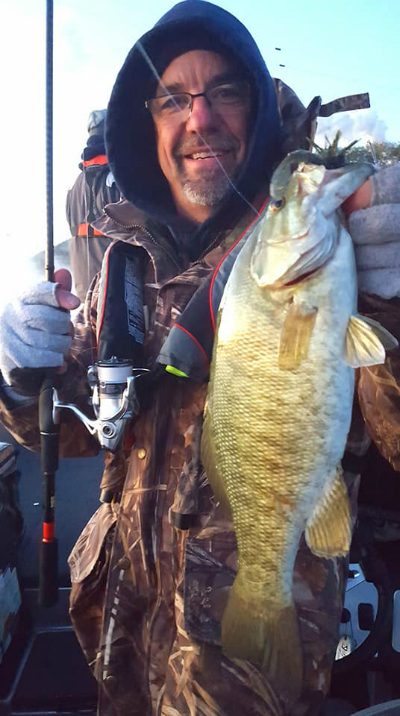 My ideal setup is a Shimano Zodias rod in 7'0 medium action with a Shimano Stradic FK 3000 sized reel with 10 lb braided line and a 6 ft 10lb fluorocarbon leader. 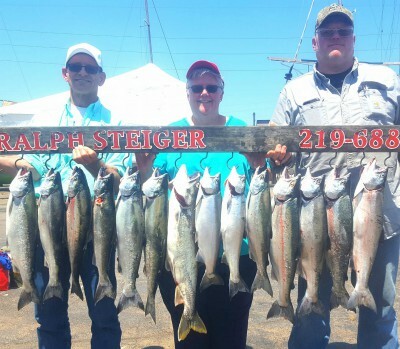 This is a setup we use on my boat for a large portion of our fishing. 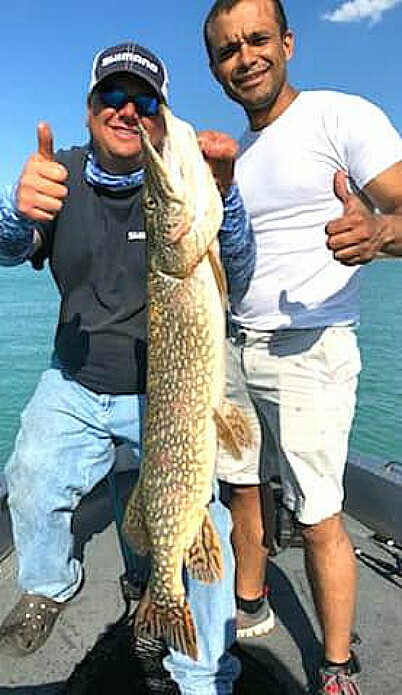 Great combo for all-around fishing. For anyone interested in getting out before the end of the year dates are very limited. 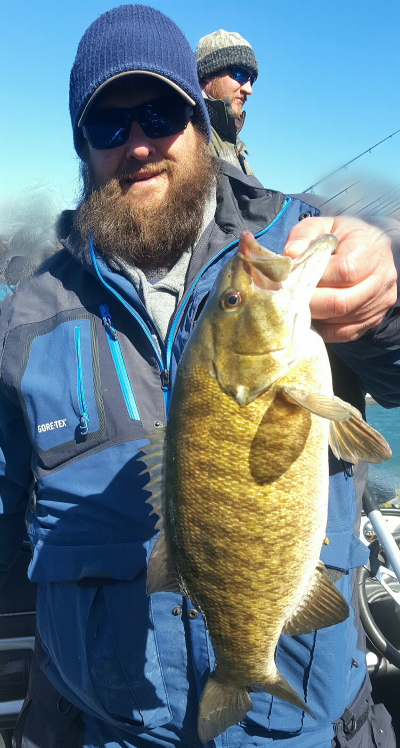 I am down to a very limited amount of smallmouth dates and just a few open dates for November/December lake trout jigging. Call me asap before they are gone. 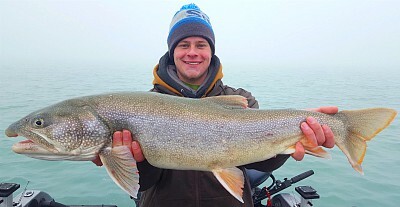 Fishing will only get better as temperatures fall. 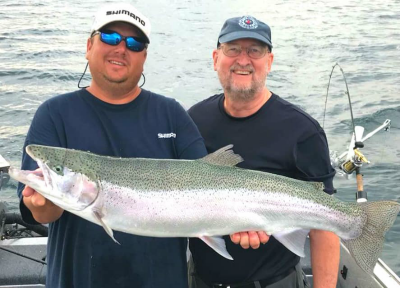 Fishing has been outstanding for coho salmon, king salmon, and steelhead trout. 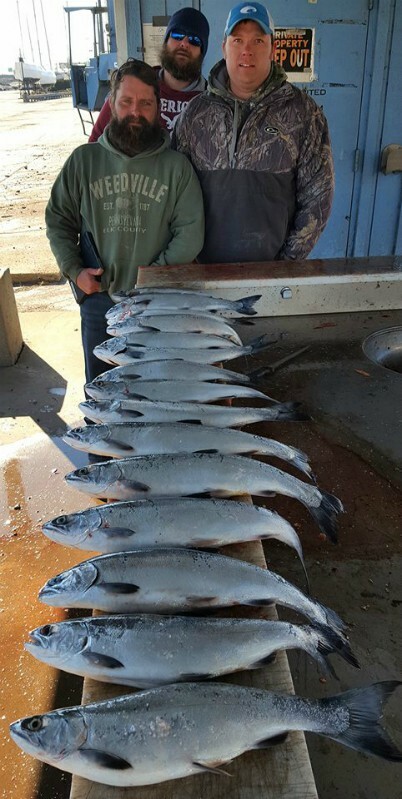 Most days we were lucky enough to limit out completely. 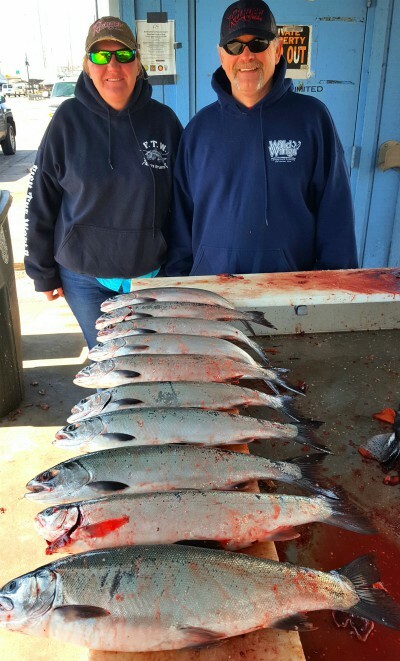 The majority of out catch was made up of nice coho salmon in the 4-10 lb range. 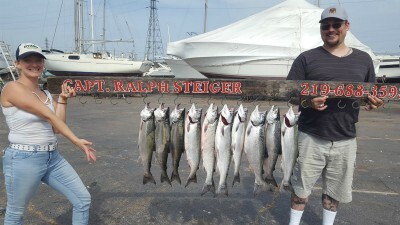 Best baits were 00 sized orange dodgers with Rapture Trolling Flies in coho size. Best colors were Comet and Astroid. We also did very well on Dreamweaver Spin Doctors in UV Crush, Live Wire, Blue Fish Net colors. Behind the UV Crush Spin Doctor I was running a Rapture UV Zenith fly, behind Blue Fish Net I was running a Rapture Silver Hypnotist fly, and behind the Live Wire I was running a Rapture UV Illusion fly. 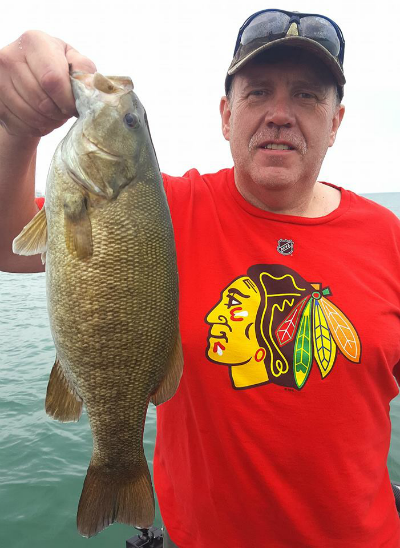 Best part was the fish actually moved in shallower than earlier in summer. 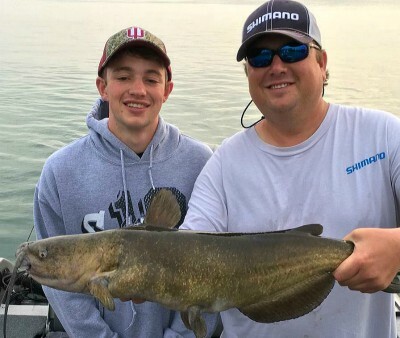 Most days we were fishing 60-70 ft of water. So far July has been a great month. Sorry for the lack of reports, I have been slacking big time. 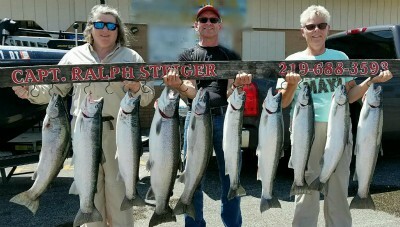 Fishing was outstanding for me from the end of April thru June. 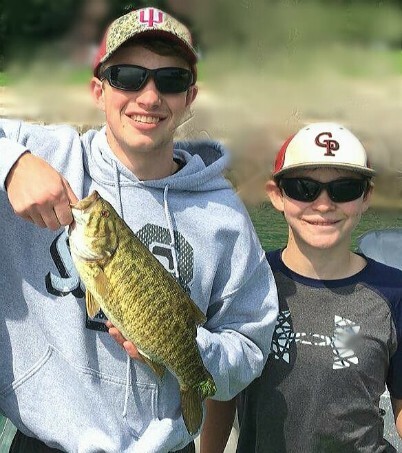 Almost all of my focus was on smallmouth fishing. 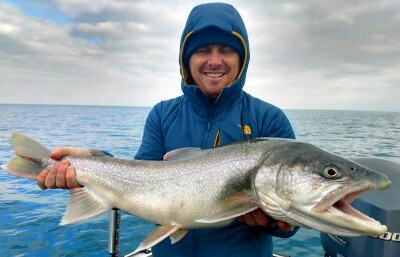 As great as fishing was the weather still was playing a huge part in trying to get out safely. Much like most of this year we seem to have a pattern of 10 days of great weather and great winds followed by unseasonable cold spells with tons of wind for a week at a time. I wish we could have had a couple more good weeks of weather this spring but nothing we can do about that. 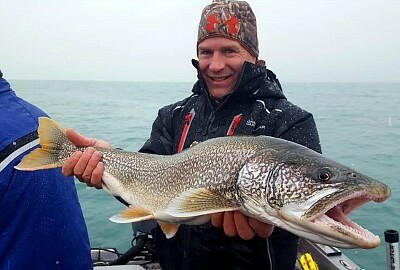 This past May and June was some of the best fishing I have had in 12 years of guiding full time thru these time periods. Pretty much everyday we were finding away to make the trip into a success. 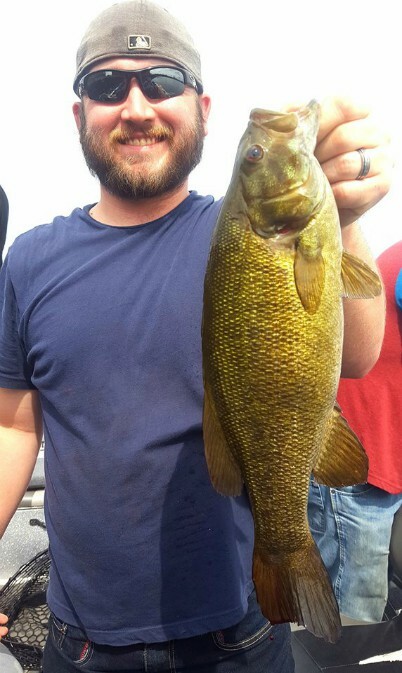 Most days we were jig fishing throwing 1/4 to 1/2 oz. 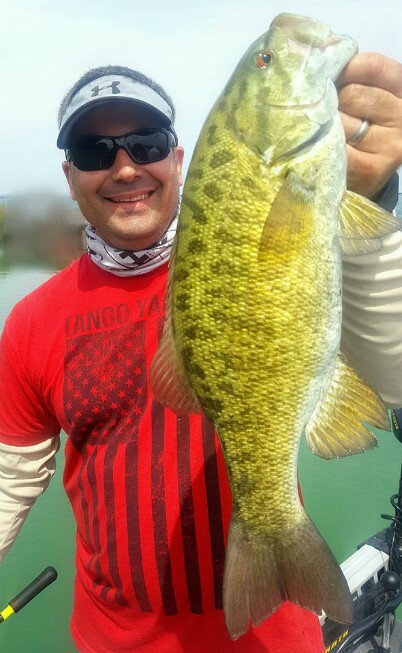 tube jigs, 1/4 oz. 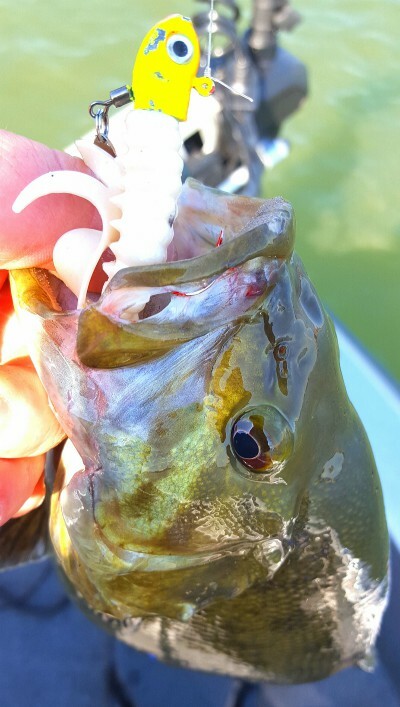 jigs with Lure Craft Little D's, or swimming Jackall Rhythm Waves in 3.8 size on 1/8 jig heads. 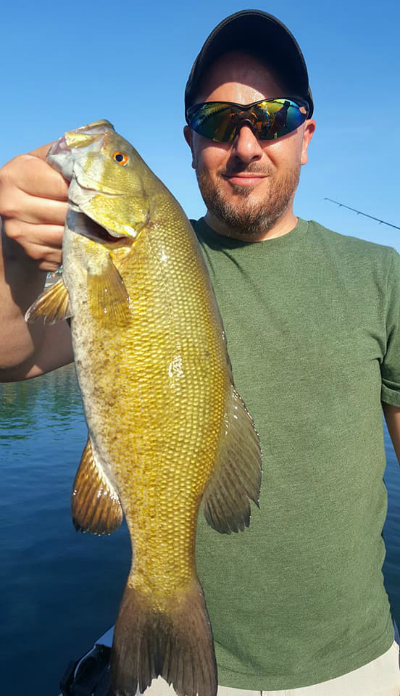 The smallmouth are all now in post-spawn summertime patterns and I will continue to fish for them all summer, however most of my focus from July 1st thru mid- Aug. will be on salmon/trout fishing. From mid- Aug thru the end of Oct. 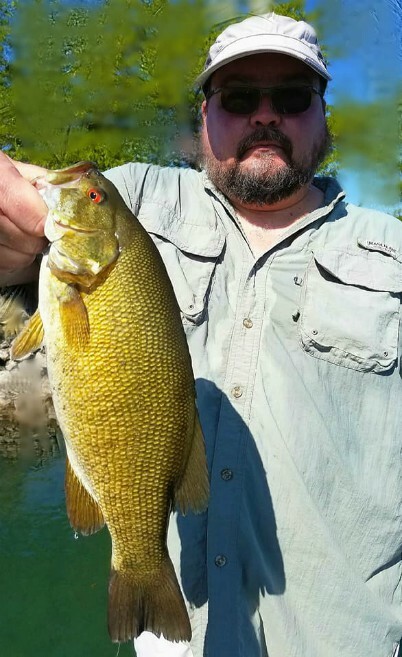 I am back in smallmouth mode. I still have some summer dates available. 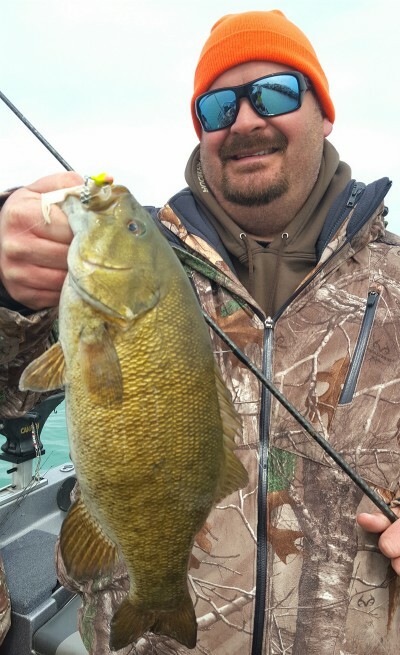 Also am already starting to fill up for Fall smallmouth fishing. Feel free to call me for open dates. Good Luck. Alright it's been awhile since I updated this page, sorry for the delay. The first 1/2 of March the weather seemed to be breaking and we were having some much more mild weather. Than mid-March came and guess what winter decided to come back. 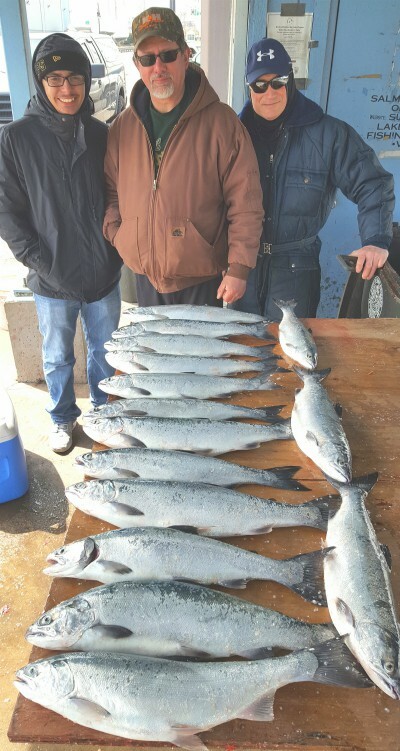 Good news was even with the below average temperatures and bad weather fishing remained very good. We did have one tough patch in there for about a week when the waves would not allow us out safely. 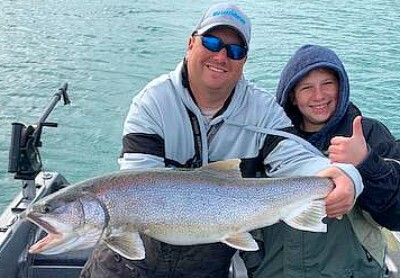 We spent all of my trips either jigging for lake trout or casting for coho and brown trout, mostly casting for salmon/trout. 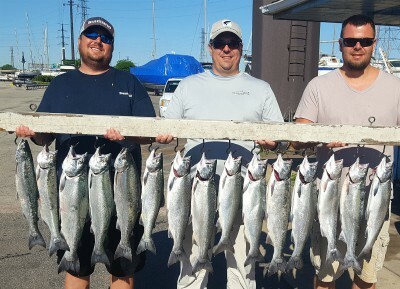 All the fish you see in these pictures were caught casting using Shimano Zodias medium action rods and Shimano Stradic 3000 sized spinning reels with 10 lb braided line. 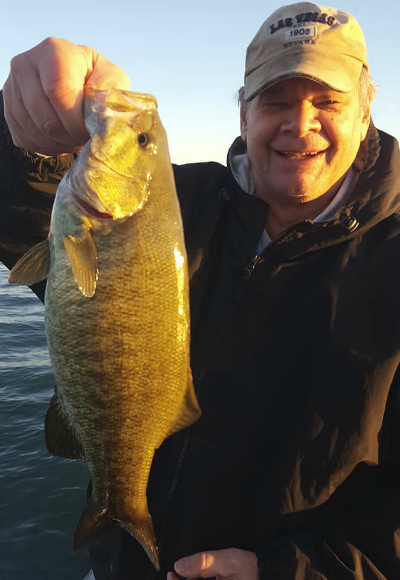 During the early spring I love casting using the light gear. 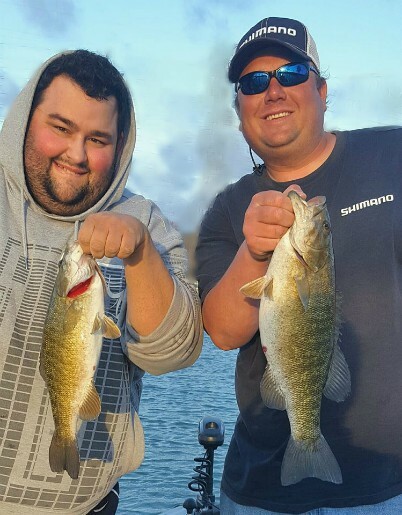 Best baits were Northland Thumper jigs in 1/4 oz. 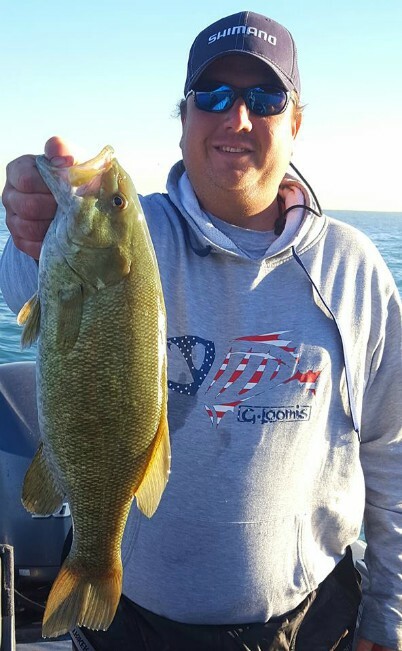 size in Sunrise color with a Northland 3 inch Impulse grub in white. 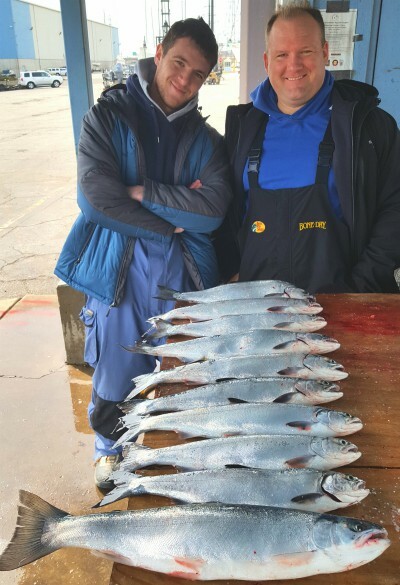 One thing that I do that makes a big difference is tipping the jig with a small 2 inch strip of raw squid, we do this every trip. 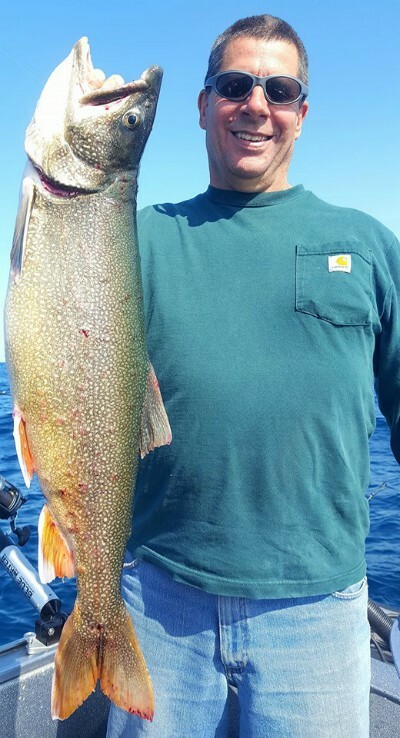 I watched a lot of other boats without squid have some very tough days while we were constantly busy with fish. 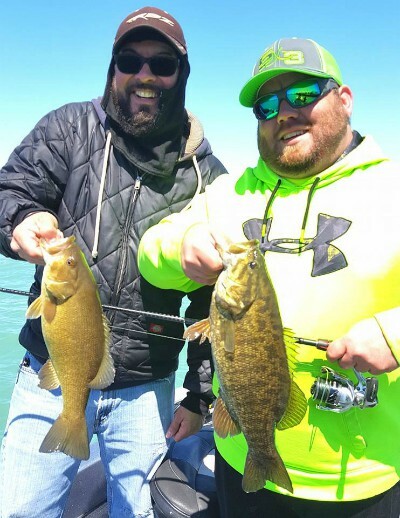 Typically April means nothing but smallmouth trips for me but due to the way below average water temperatures and super cold weather my trips turned into a split. 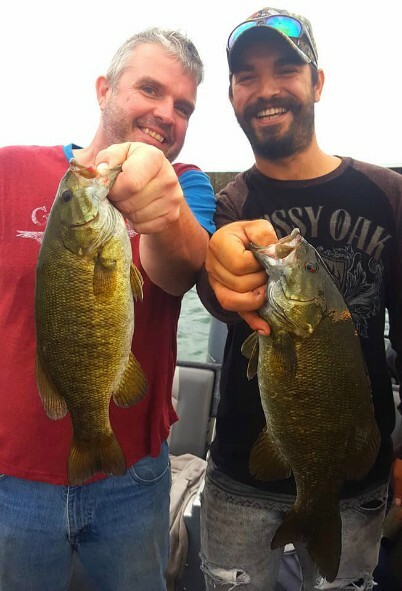 We would cast for coho and browns in the early part of our trip once we had our fun with them we would switch up to smallmouth fishing. 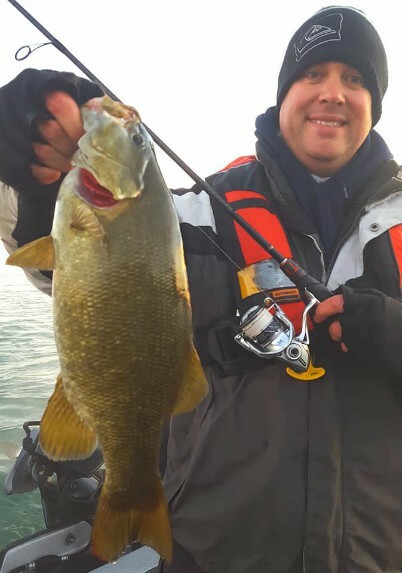 Even with the below average temperatures the smallmouth were still pretty cooperative. 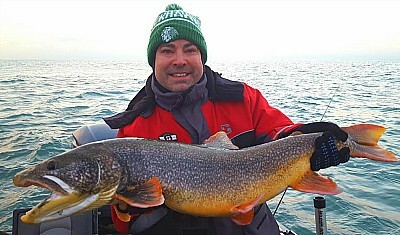 We did have to work for them but between the great salmon fishing and the bonus smallmouth my trips were going great. 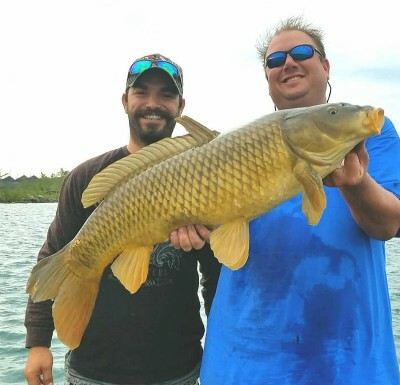 We also got a bunch of monster carp that ate our tube jigs! 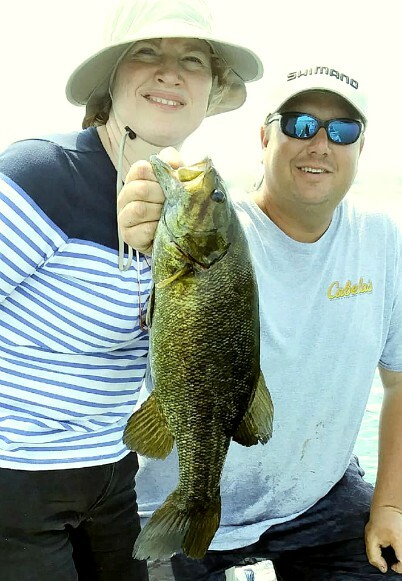 Best smallmouth baits were either blade baits, Northland Fatty tubes in dark colors, Lurecraft Little D's in dark colors, or the same grubs we were using for salmon and trout. 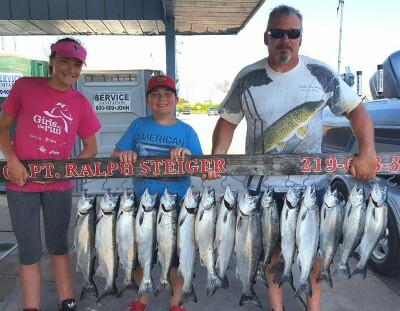 The other big bonus that early April brought for the first time in about 6-7 years were a large amount of spring king salmon, that were averaging 15-20 lbs. 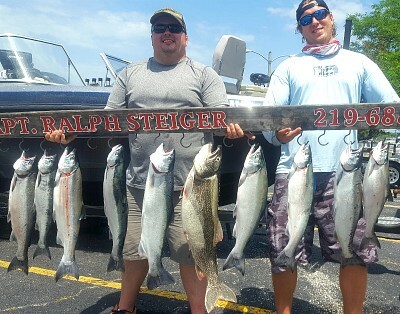 The guys trolling were getting some on J-plugs and Dreamweaver Spin Doctor/Rapture fly combos. 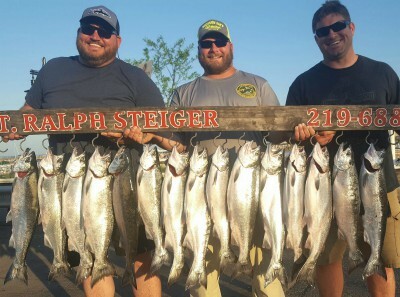 Well we weren't trolling but wanted in on some kings! 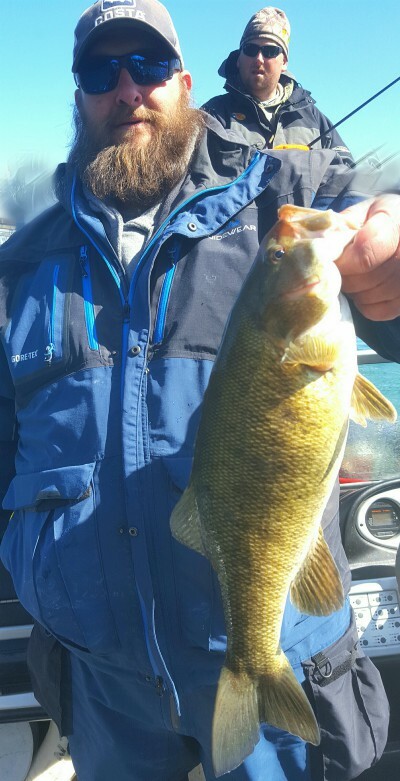 The cohos started sliding out of shallower areas that I was casting and we started fishing main lake points and open water. Sort of the same areas the trollers were using. 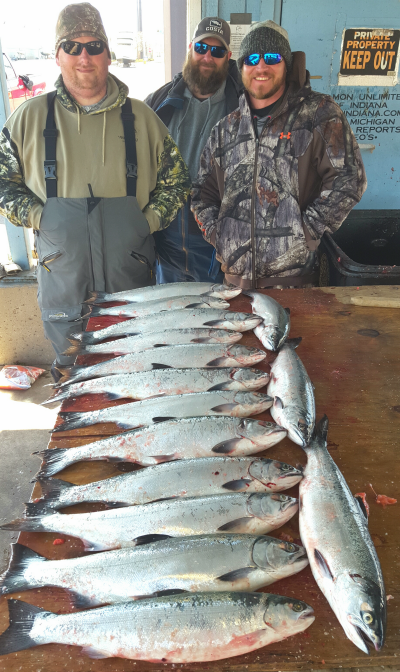 We started having great success drifting in 30-40 ft of water casting but only fishing the first 10 ft of water. 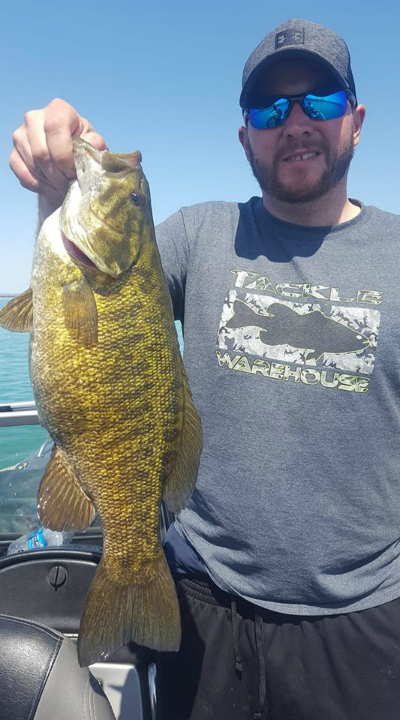 I was constantly watching my graph for bait and fish marks in this open water. Once we found a pod we would sit on them and cast. 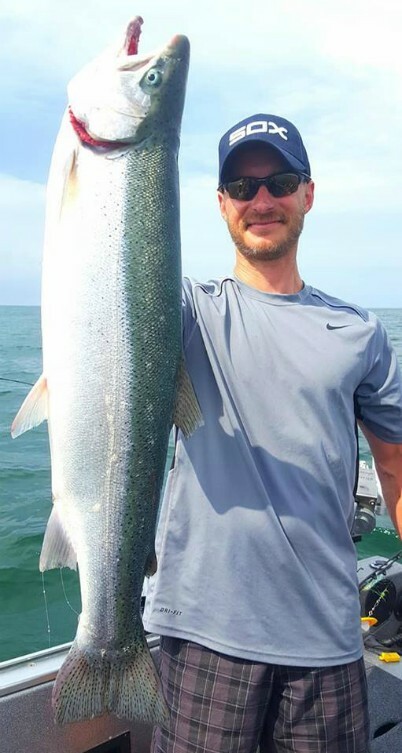 Guess what after catching a lot of cohos on the morning I set the hook and after a very intense 15 minute battle I landed a 17 lb spring king on 10lb test and spinning gear! What a battle to say the least! 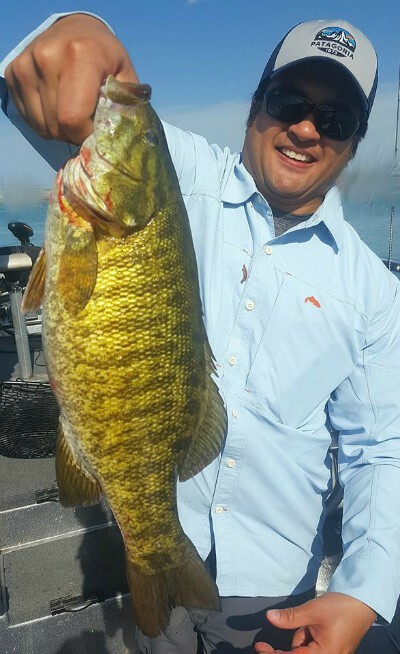 The next day we were doing the same thing and a guest on my boat landed a 18lber! Here's the bad news. 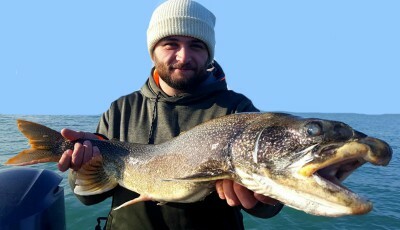 Since the end of the 2nd week of April the weather and waves have been terrible, most days unfishable and not safe. I have had no choice but to cancel a lot of trips due to just not safe conditions. Good news is looks like the weather is finally going to improve here starting tomorrow. I expect a great rest of the year. Call me for dates I am now booking mid-Summer and Fall dates. Enjoy the pics, be safe. 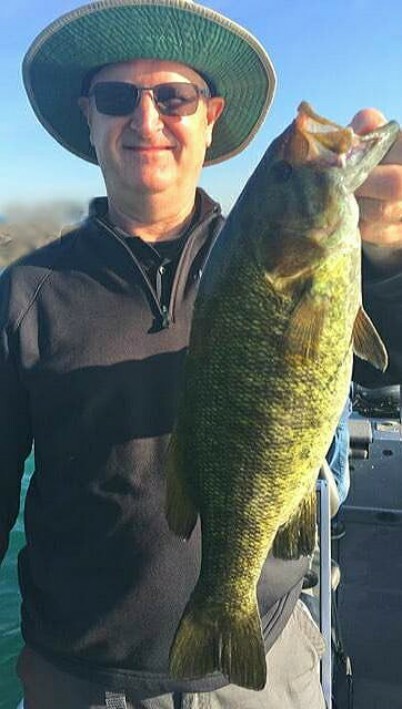 After a long winter it's nice to get back to fishing. 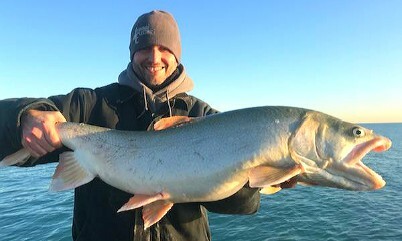 So far it's been a great start to the season with lots of great action jigging for big lake trout, some bonus whitefish mixed in, and the start of a great spring coho bite. 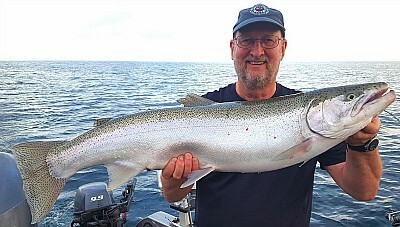 Everything is looking great and I am expecting some very good coho salmon and brown trout fishing coming up in the next few weeks. 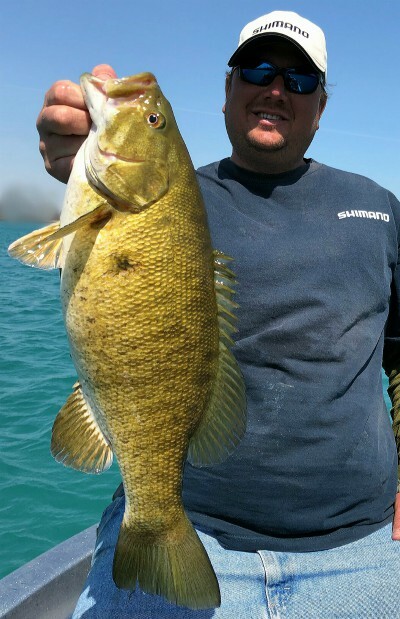 Smallmouth fishing should also get going strong by the end of the month. 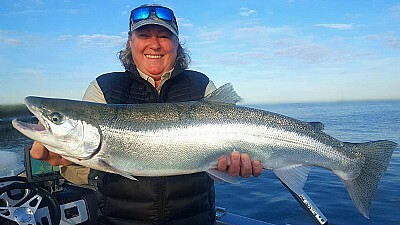 I will try to post more often on this site but for anyone looking for daily salmon/trout reports check out www.captainsreports.net for detailed info. Dates are very limited for spring thru early summer, call for more info. Not the same winter as the last couple years. 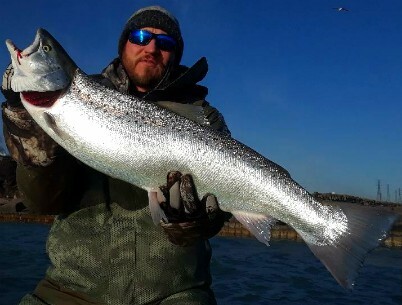 Lots of snow, cold temps, and ice have kept us off the water most of this winter. 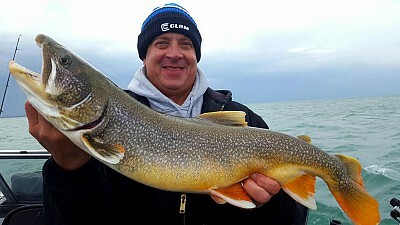 Good news is looks like the lake will be ice free and we will be back to fishing this week. I am very limited on open dates for March, April, and May. 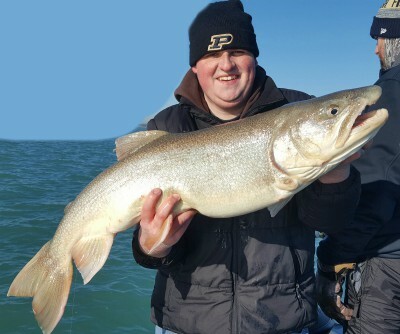 If you are interested in getting out this spring call soon or no dates will be available. Wish me luck, time to get back to fishing! 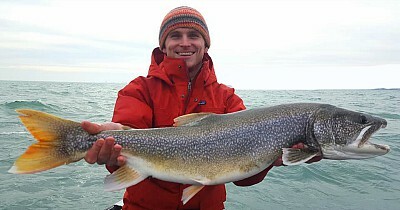 Also a huge thanks to everyone who came out to the Learn Lake Michigan seminars this past weekend. They turned out to be a huge success and I have had lots of positive feedback, looking forward to running them again next winter. 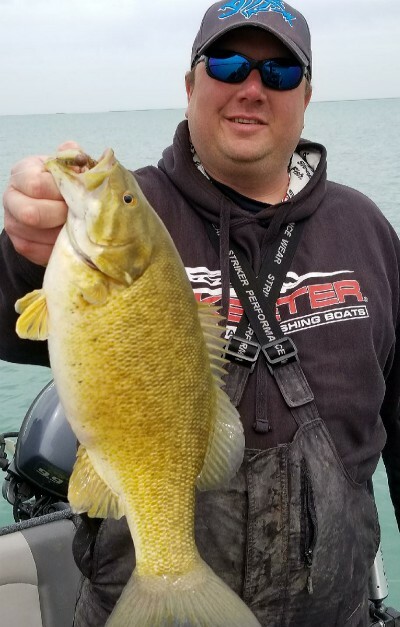 After winters brutal start it wasn't looking promising for winter fishing this year but after a few huge warm ups, rain, and heavy south winds the lake opened up and were right back to fishing. There is still a lot of large chunks of floating ice so please be careful if you plan on heading out. Use your head! 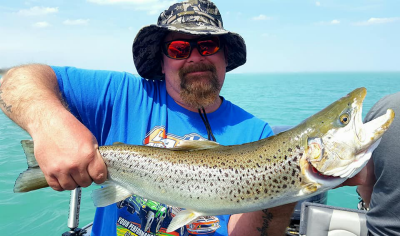 We fished 4 days this past week, first 2 trips were slower due to muddy water but we still caught a bunch of brown trout and everyone had a good time. 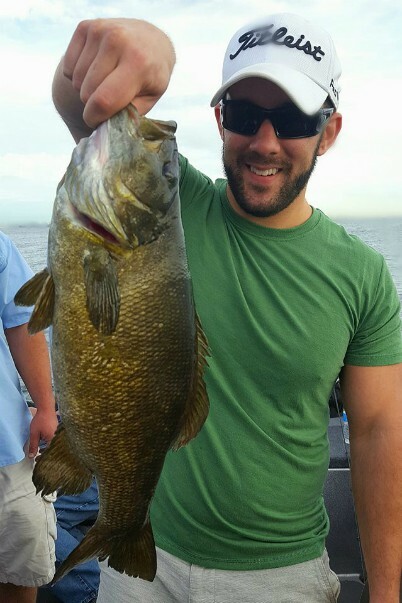 As the water cleared up fishing improved big time. 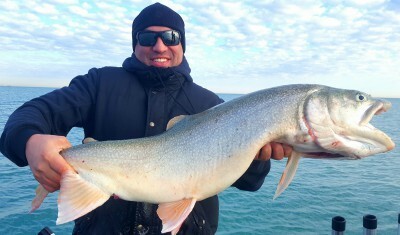 Jigging lake trout was good as well as casting for brown trout. 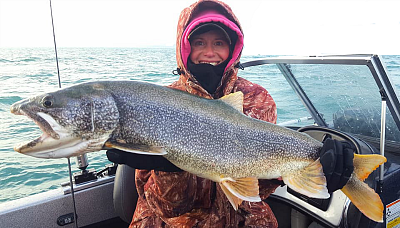 11-1-17 thru 12-1-17 Lake Trout Mania and Monster Waves! 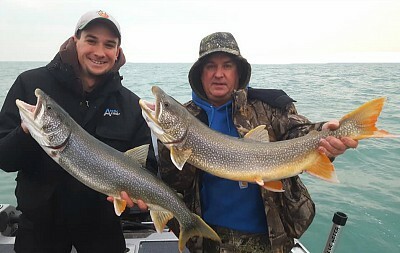 Same story different month, awesome fishing and bad weather. The month started out great and ended tough. Since Thanksgiving the wind has been relentless. 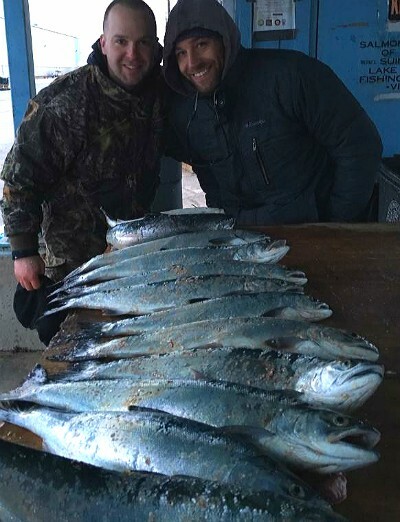 The amount of small craft and gale force wind warnings put a big halt on fishing. Luckily the first 3/4 of November were excellent. 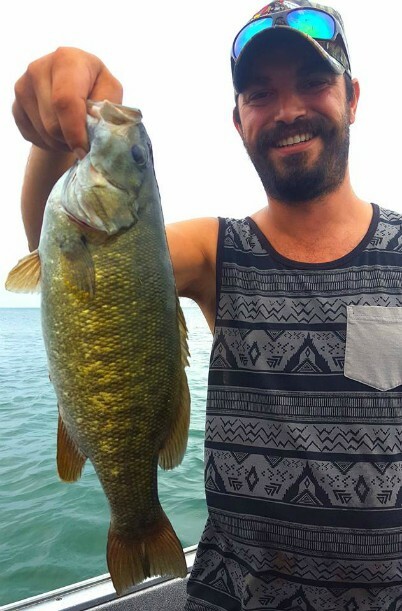 Fishing was great just about every trip. 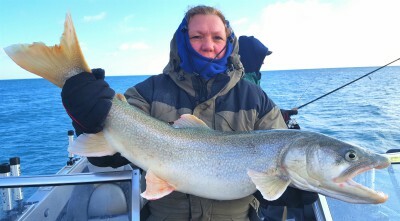 We had a huge amount of success jigging for the lake trout. 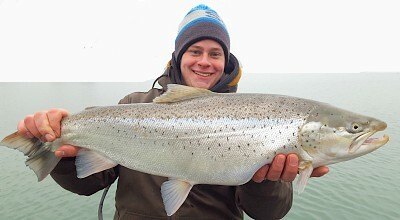 We even caught a 26 lber jigging on 10lb test! Pictured below, first picture. 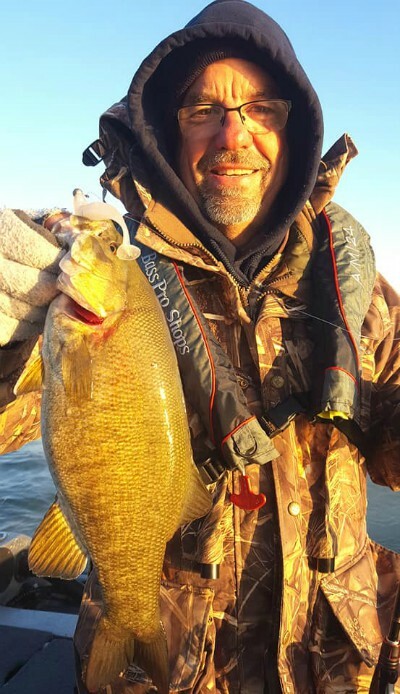 The good news is the fishing will remain great all winter. 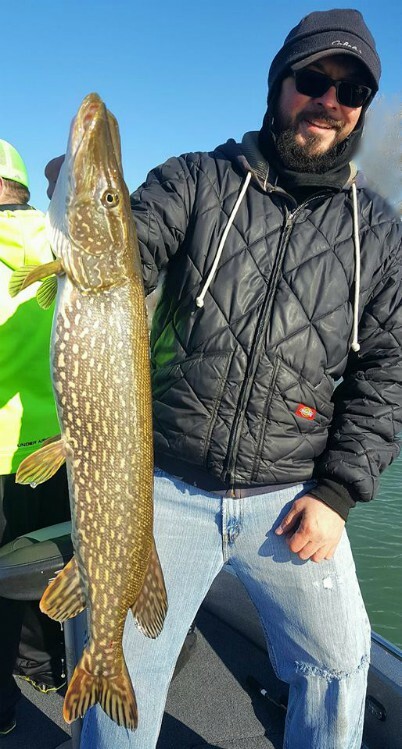 Hopefully we have a mild winter and can get back out and catch a ton more. 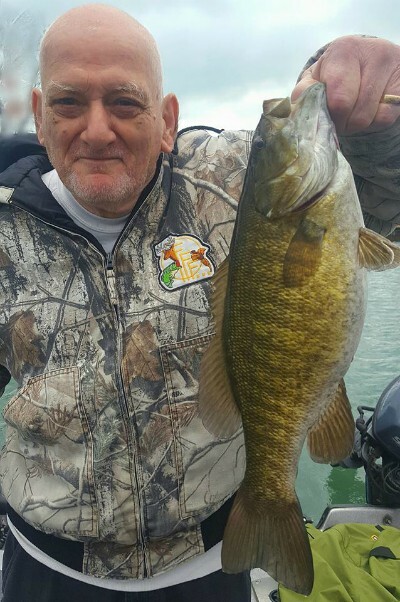 I will continue fishing all winter feel free to call me for more details. Also I am booking 2018 trips on a daily basis, call me sooner than later so dates are still available. They fill up fast. Gift certificates for the holidays are also available, just call or email for info. Ralphish00@aol.com or 219-688-3593. Hope everyone has a great holiday season, be safe. Fall has definitely had it's ups and downs. 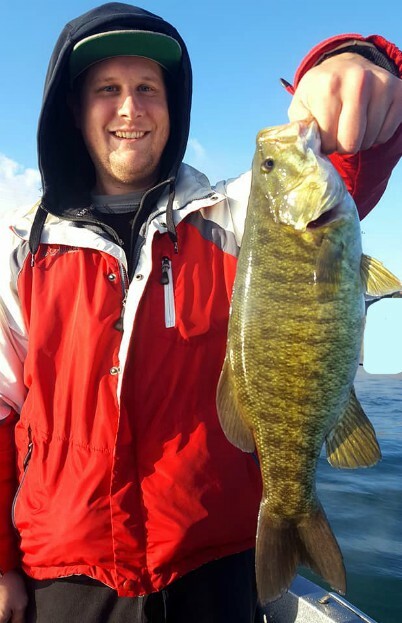 One week I can fish everyday and the weather is great the next I can hardly get out at all due to wind and waves. 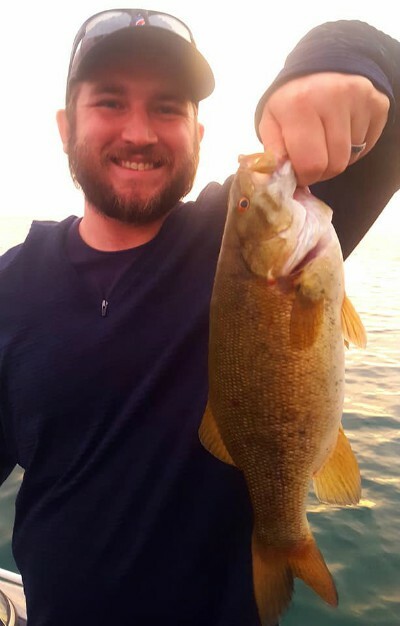 Fishing has been very good for the most part. 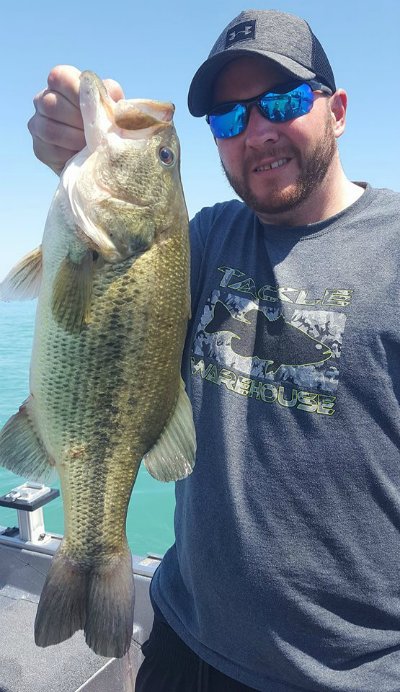 It's very frustrating when I have good fishing and can't get out as much as I want too. 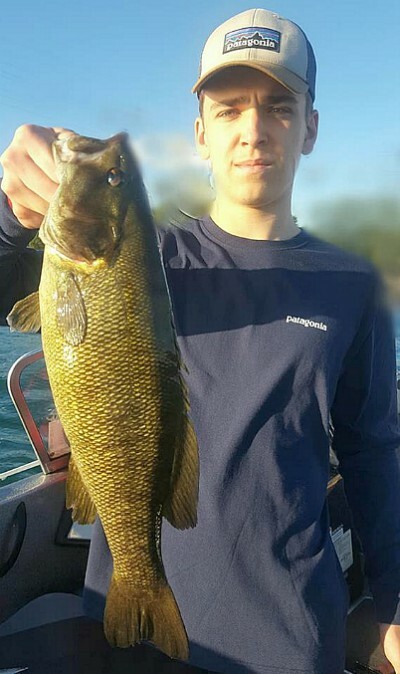 Late September was great smallmouth fishing, mostly smaller fish but the action was great. 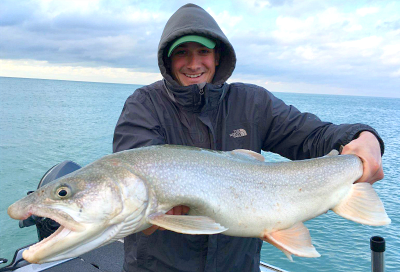 Once the first week of October came water temperatures finally started to drop after some colder weather. 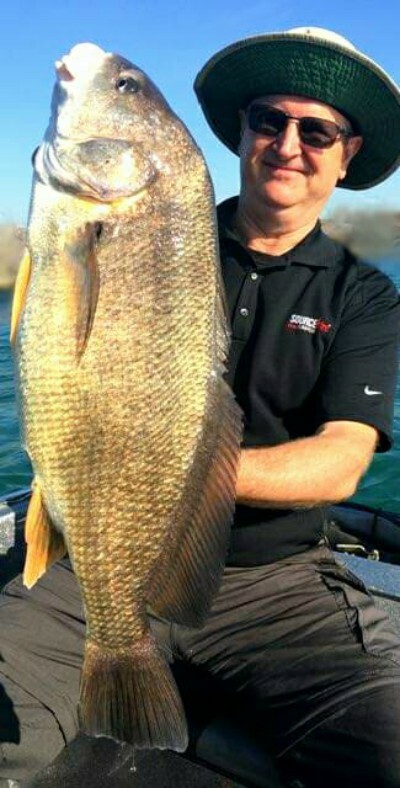 Fishing went nuts. Everyday was very good and fall seemed to be in full swing. 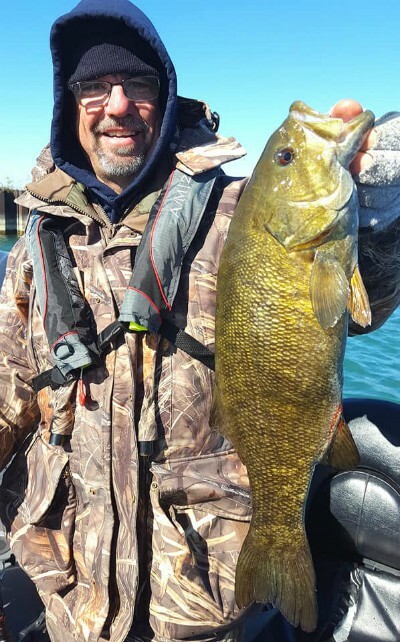 The second week of October air temperatures skyrocketed and bass fishing slowed down some. 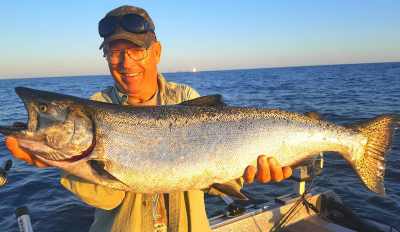 Good news was I found a small pod of King Salmon and we had some awesome early mornings and nights casting crank baits for these giants. 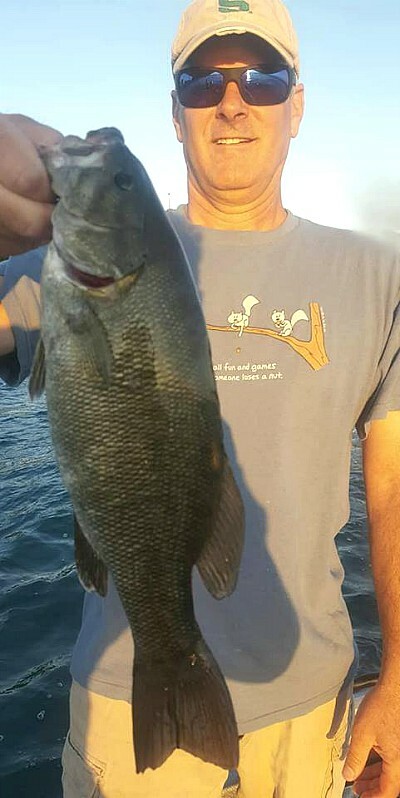 Unfortunately this bite didn't last more than a week or so. 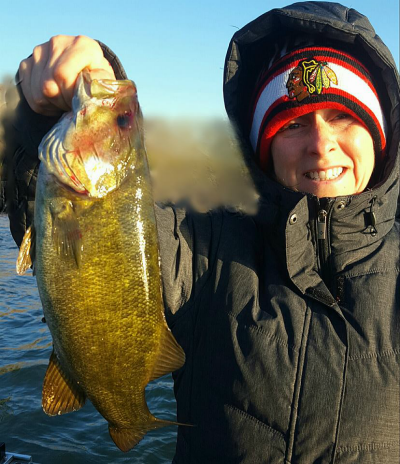 By mid October water temperatures started to fall again and once again and bass fishing went nuts. 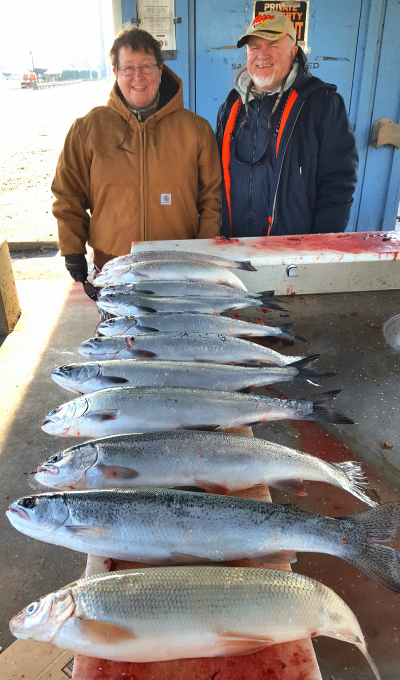 Fishing remained very good thru the end of the month. Back to the problem, the weather was so uncooperative for days on end we missed a bunch of days due to unsafe conditions. Currently I am going thru the same issue, bad weather. Hopefully we get some normal stable weather for November. 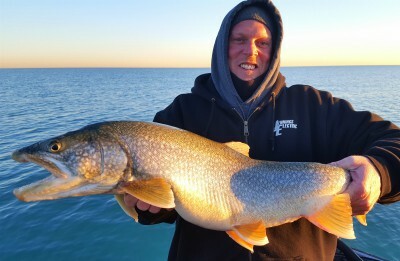 I will be lake trout fishing all of November and thru the rest of the winter months. 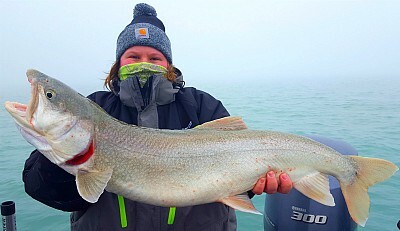 For anyone interested in jigging giant lake trout this winter get ahold of me and I will put you on my call list for when we get safe weather thru the winter. All I need is name and number and I will call/text when I have open dates from Dec.-March. Also I have already been filling tons of 2018 dates. Call for open dates. Good Luck and be safe. The end of August was tough! 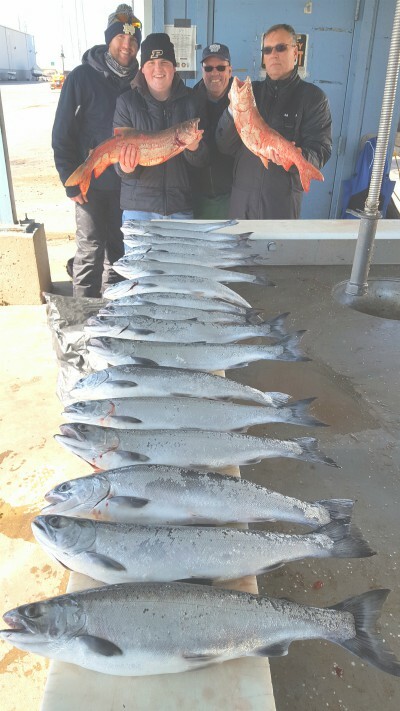 The water temperatures became extremely warm and the salmon disappeared on us very quickly, sort of a repeat of last season. 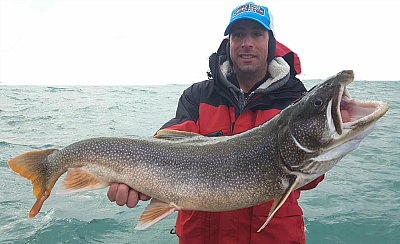 We did have a few good trips from the 18th thru 22nd then it became extremely slow for salmon but there were still lake trout around. 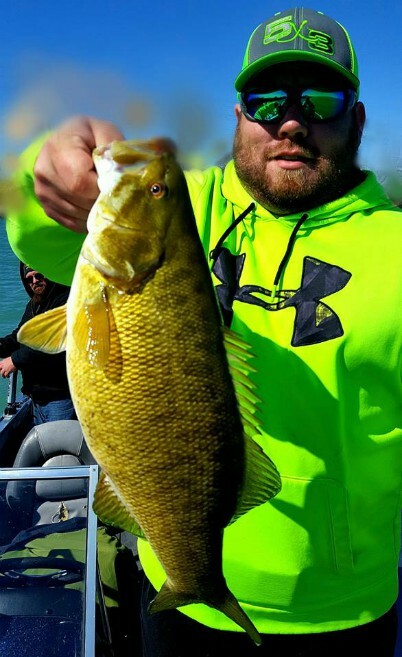 My trips switched over on September 1st to smallmouth fishing but unfortunately we had a ton of heavy North winds and the water was either very stirred up or not safe to be on due to wave heights. 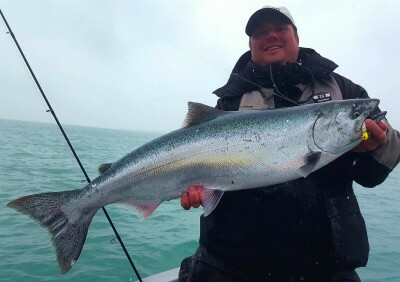 Good news is since the 10th of September fishing has picked up big time. 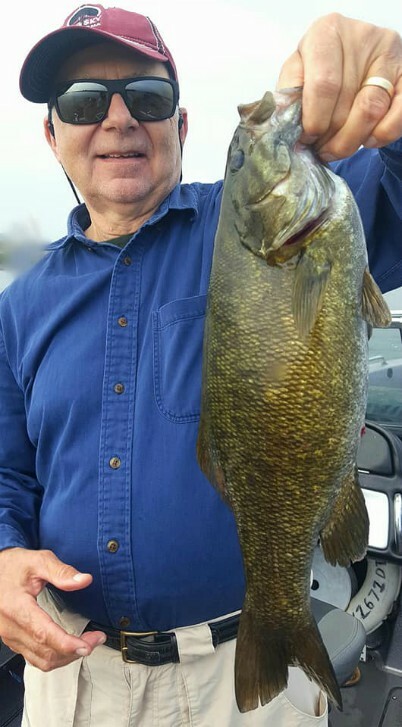 Smallmouth fishing has been very good. 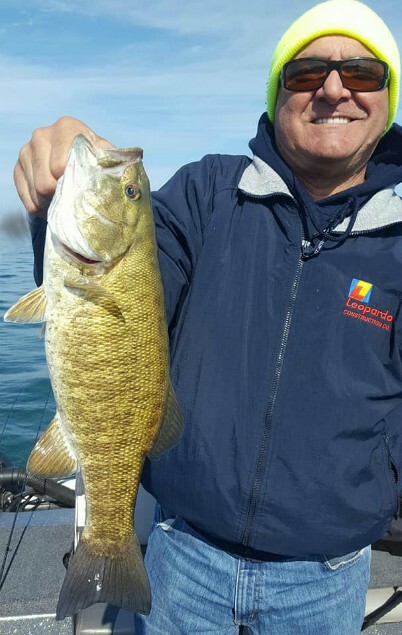 Smallmouth fishing has been our focus and will be thru early November. 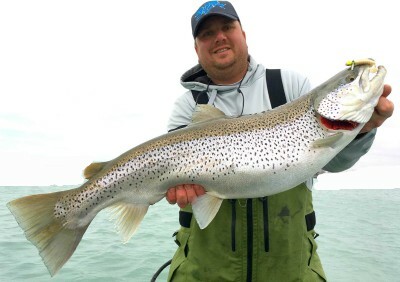 Most days the action has been very good and should only get better thru the Fall, especially for bigger fish. 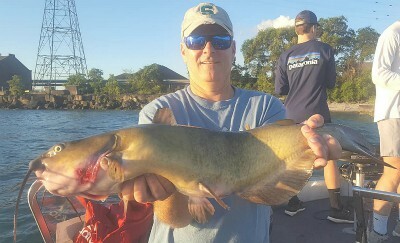 We even caught a couple of big catfish, pike, and white bass mixed in! 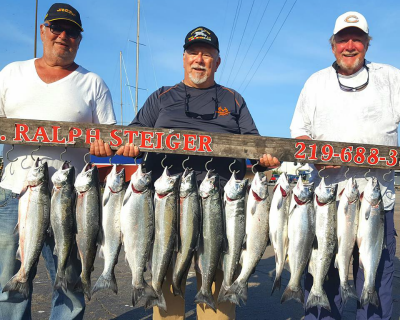 Our Fall King Salmon run has been slow at best. 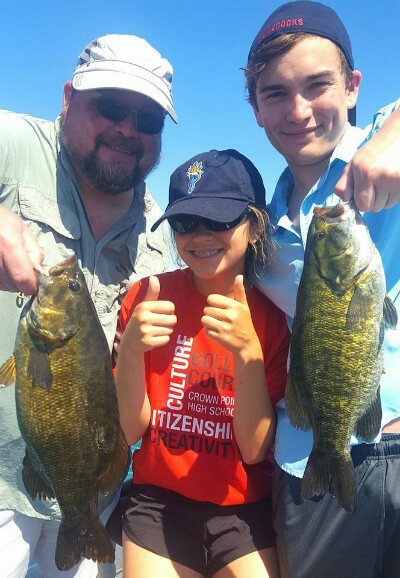 We have caught a handful casting but definitely nothing to brag about. This could still change over the next couple weeks. 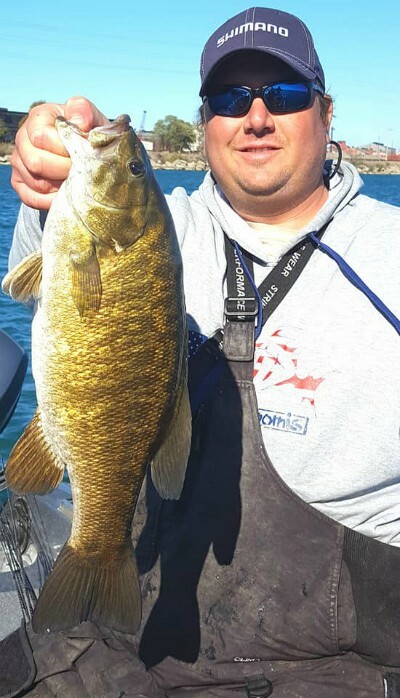 Best baits for the smallmouth fishing have been a drop-shot rig with a Jackall 4.8 Flick Shake worm wacky rigged, best colors have been Cola or Bluegill. 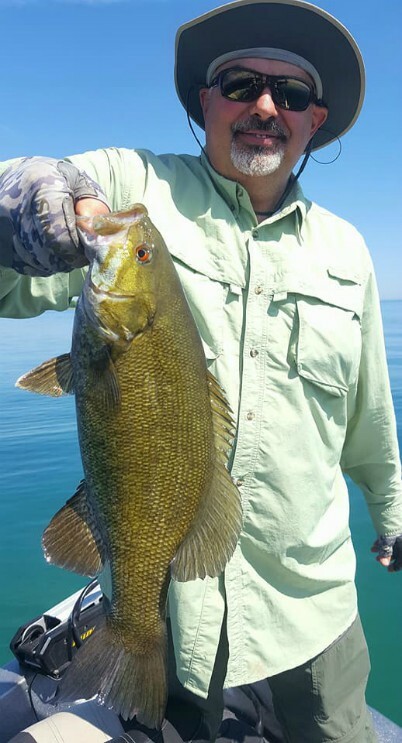 We have also done well with a Tight Rope jig in darker colors with a Lure Craft "Little D" in SI color or Dark Melon color. 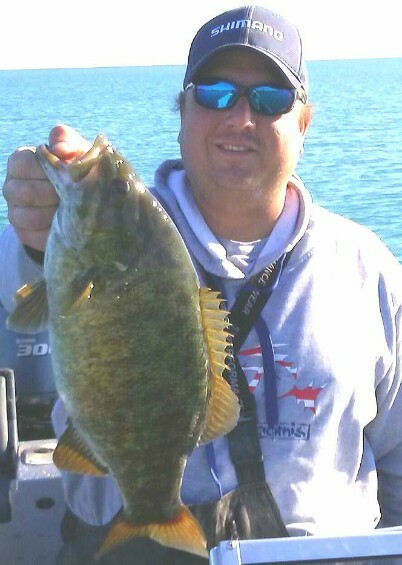 I still have some Oct. and early Nov. primetime smallmouth dates open give me a call if your interested. 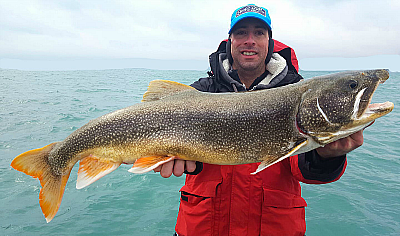 I am currently booked up most of Nov. for Lake Trout jigging dates but do still have a few in Dec and I will continue fishing for them all winter long. 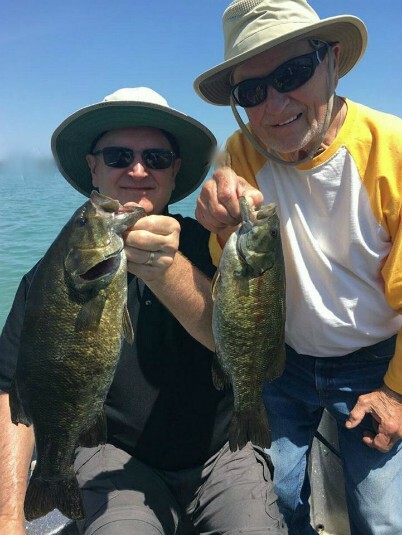 The weather has been great and so has fishing. 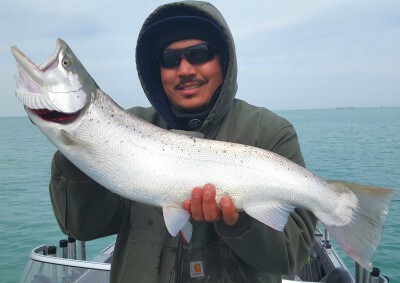 The salmon and trout bite in deep water continues to be consistently excellent. 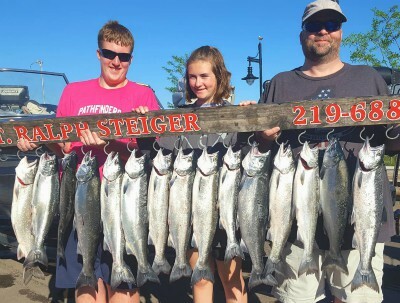 Most days we have had a mixed bag of lake trout, king salmon, coho salmon, and steelhead trout. 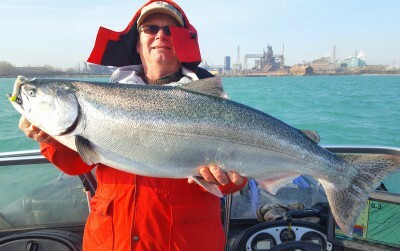 We have had coho up to 10 lbs, lake trout and king salmon up to 20 plus lbs, and steelhead up to 13 lbs! Best action has been in 150 to 210 ft of water. 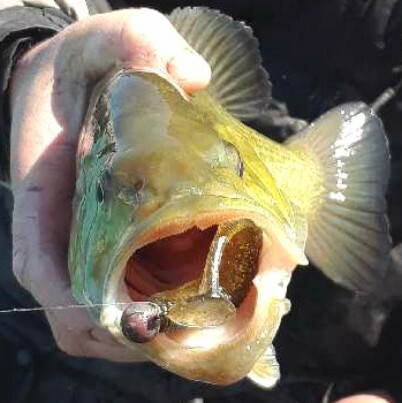 Best baits have been Dreamweaver Spin Doctors/Rapture Trolling Flies or Dreamweaver mag and super slim spoons. Best color Spin Doctor/Rapture fly combos have been Blue Fish Net with Silver Hypnotist fly, Live Wire with Lime Tonic fly, UV Crush with UV Zenith fly. Best spoons have been Dreamweaver Magnums in Lemon Ice, Carmel Dolphin, Green King. 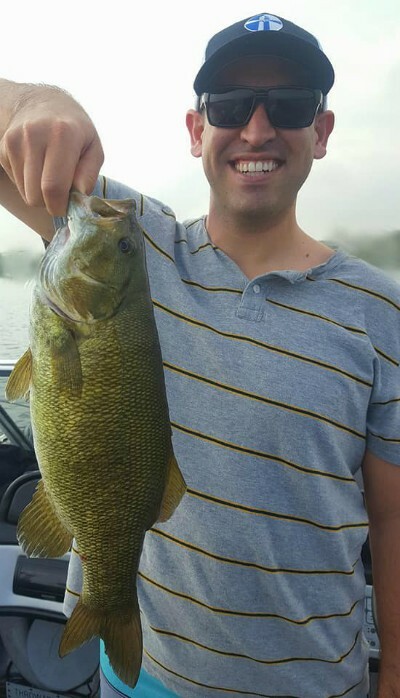 I also bass fished 3 times this past week and fishing has definitely improved. 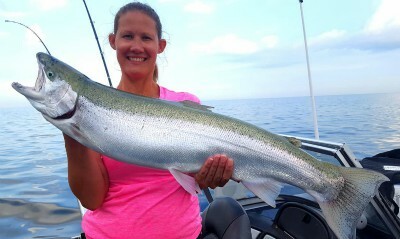 Still was hard to catch bigger fish but the action was excellent and we were busy all day. 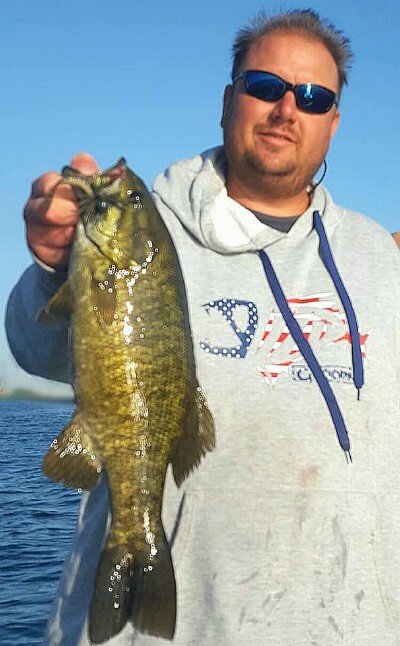 Best baits were Jackall Flick Shake 4.8 inch worms on a drop-shot rig. 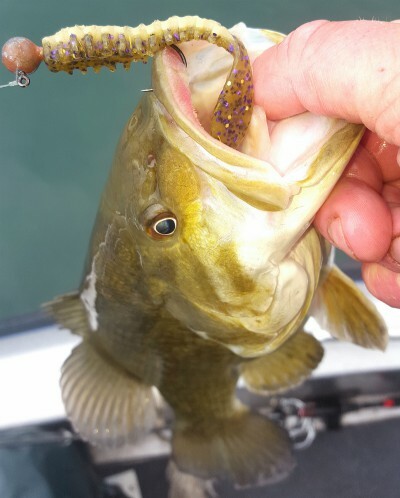 We are rigging these baits thru the center (wacky style). 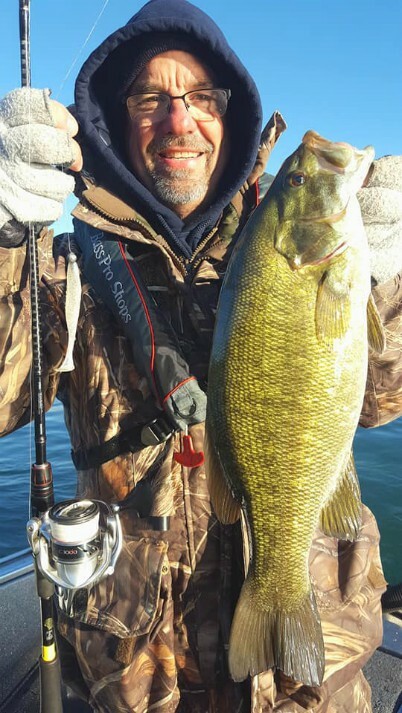 This rig was excellent last year in the late summer/fall. 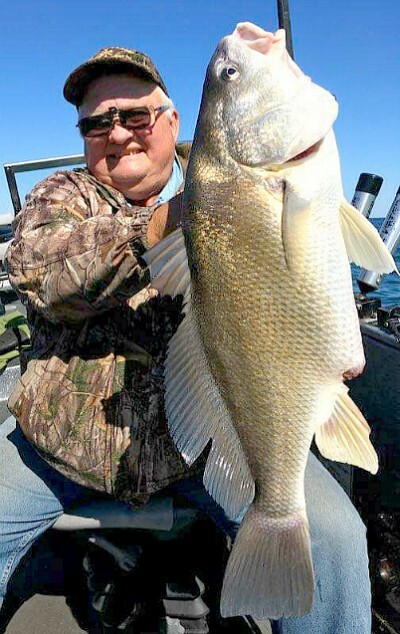 Bass fishing is only going to get better in Sept. and Oct. The last few years fall has been very good and I am expecting this year to be great too. 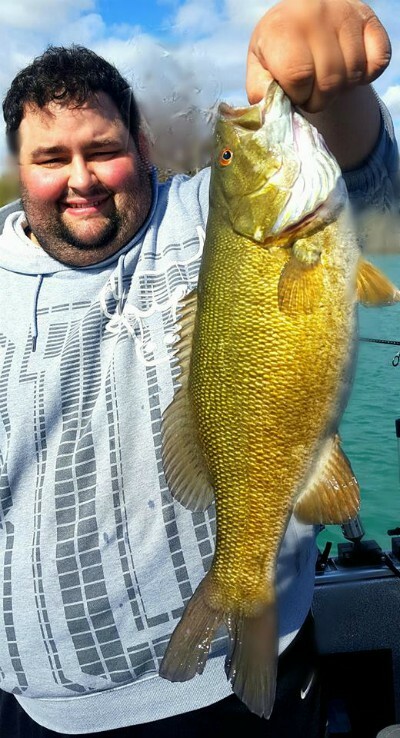 I still have a some dates open for fall bass fishing. Give me a call asap if interested. 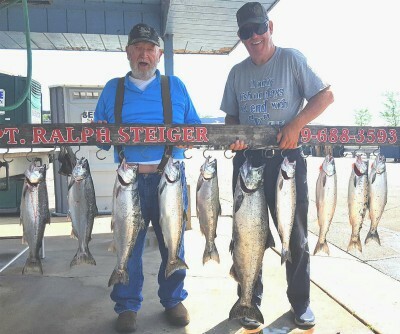 I will be salmon/trout fishing for a couple more weeks then switching up to bass fishing for Sept. and Oct.
7-12-17 thru 8-4-17 One week of terrible weather followed by some GREAT fishing. Well we went thru a 10 day stretch of monster waves and wind, 7 of these days had a small craft advisory in effect. Needless to say this kept us off the water. 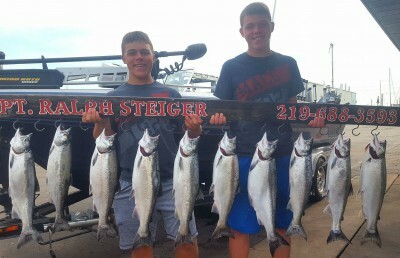 After the winds and waves calmed this past week has been some of the best salmon/trout fishing of the summer. 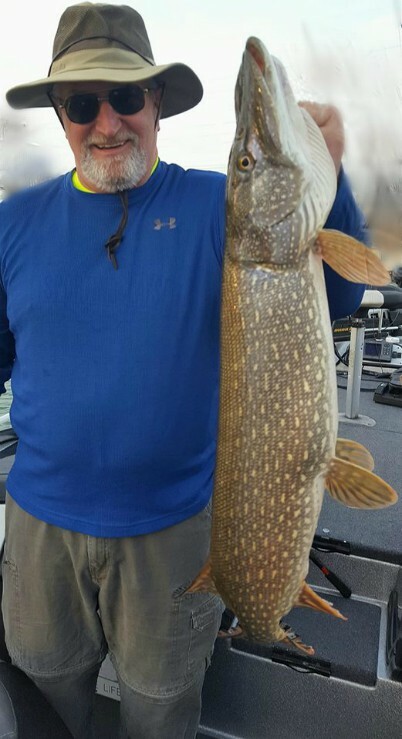 Easy limits and tons of action. 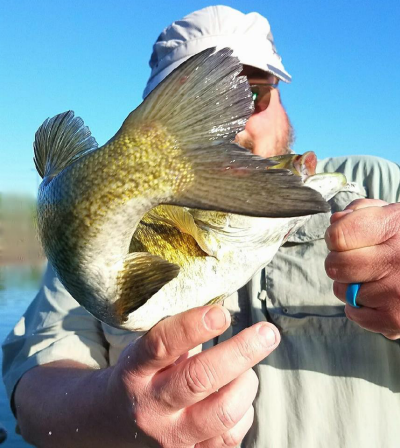 It has been a mixed bag of all the species. 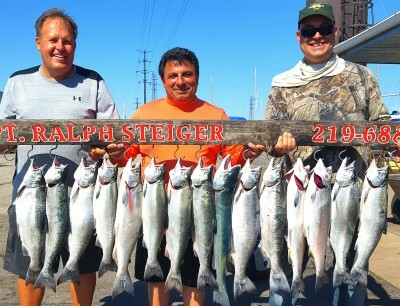 We did have a 3 kings in the 18-20lb range this week and a ton of very nice steelhead trout. 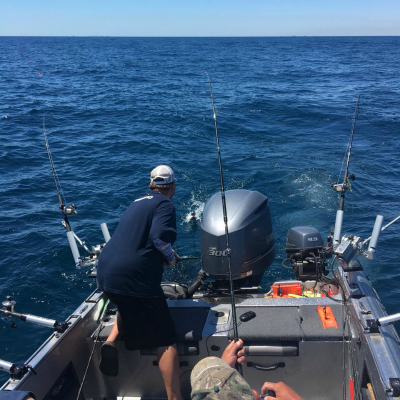 The Shimano Tekota drags were ripping! 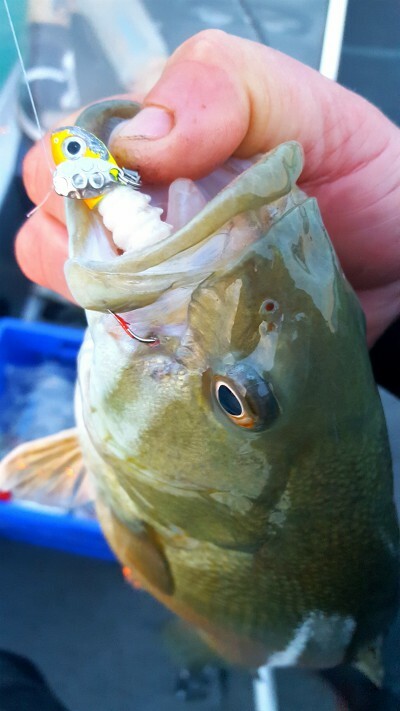 Best baits have been Dreamweaver Spin Doctors/Rapture Trolling Fly combos in: Live Wire Spindoctor/Illusion fly, Blue Fish Net Spindoctor/Silver Hypnotist fly, Chrome Frog Spin Doctor/Green Dude fly. Spoons have been great too. Best colors have been Dreamweaver Super Slim spoons in Bumble Bee, Carmel Dolphin, Green King, Blue Icicle. 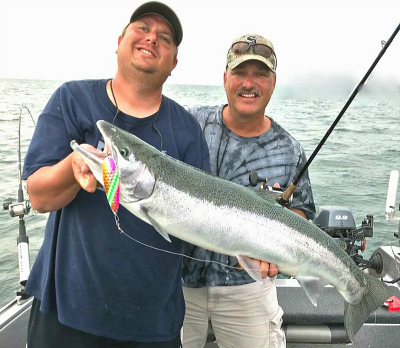 For the steelhead we have had very good success with Mag Dreamweaver spoons in Bumble Bee, Steelie Stomper, and Double Orange Crush. 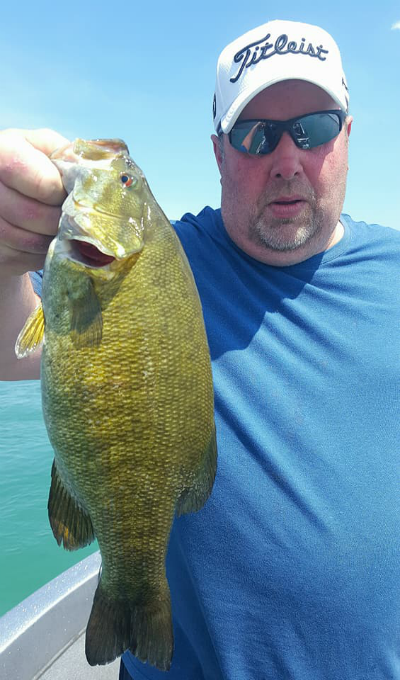 Hopefully we continue with some nice weather and some more great fishing. 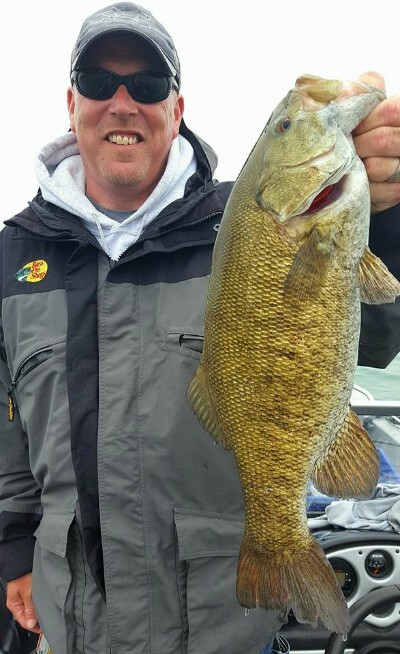 For anyone interested my fall smallmouth trips for Sept/Oct. are about 3/4 of the way filled up give me a call for dates while there are some still open. The last few years the fall has been excellent and I am really looking forward to this year. 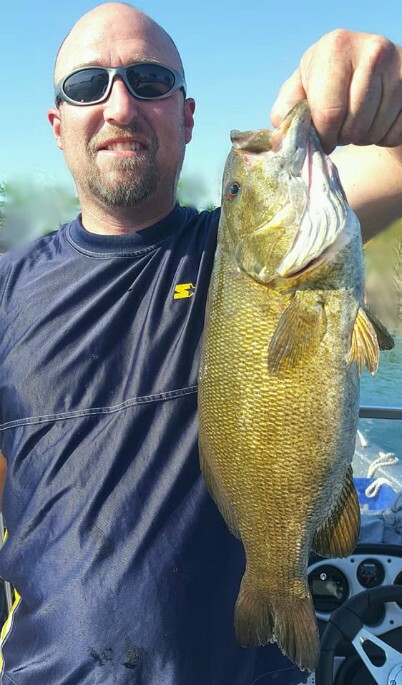 5-24-17 thru 7-11-17 Good fishing and some bad luck. Well let's start with the bad luck. My last post was May 23rd, the next day I was working in my garage and I fell. I landed on my elbow and broke it. This took me out of commission for a few weeks while it was healing. Good news is everything healed fine and I have been back in business for weeks now. 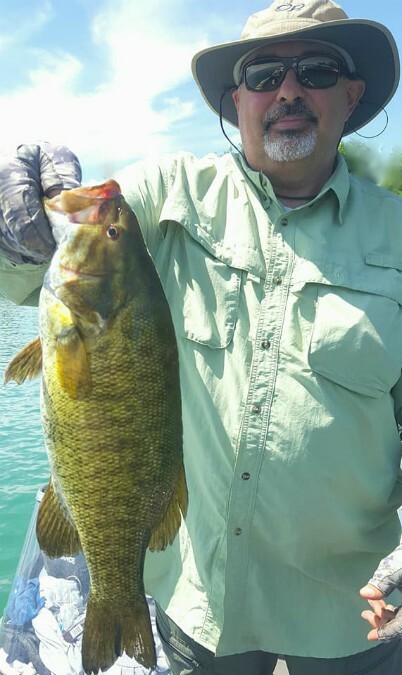 Fishing has been good both for smallmouth bass and salmon/trout. 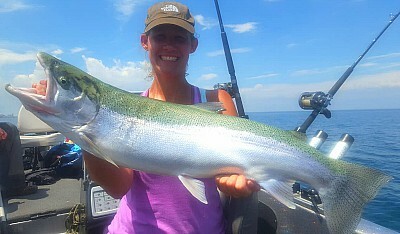 The month of June was great for coho salmon in 50-65 feet of water. 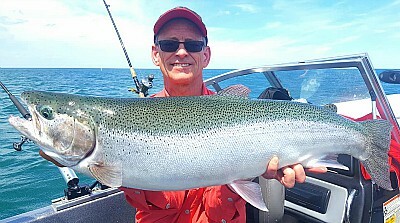 As July has approached the fishing has stayed strong and we are now fishing 70-80 ft of water. 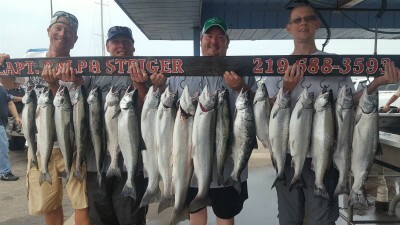 July has been a mixed bag of coho salmon, king salmon, and steelhead trout. Dreamweaver Spin Doctors and Rapture full sized flies have been very good the last few weeks. Dreamweaver SS spoon in a variety of colors have also been doing very well. 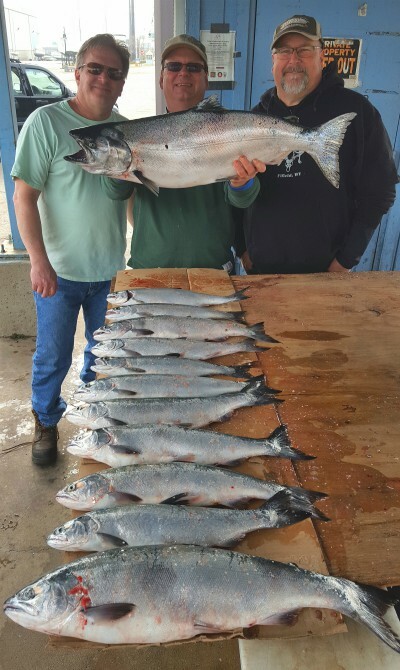 I still have a few dates for salmon avalible for the summer. 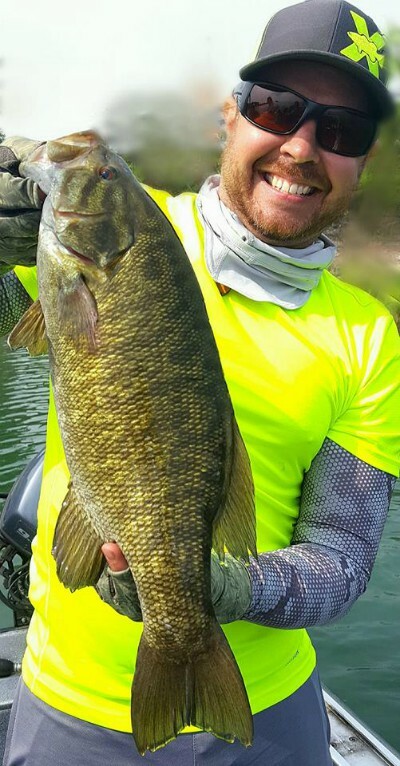 I am also starting to fill up for late summer/fall smallmouth dates. Give me a call for info. Good Luck. 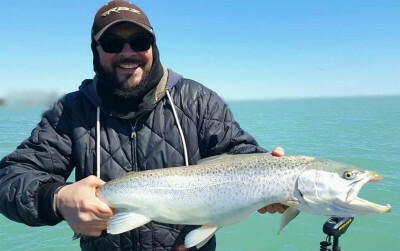 Same old story on southern Lake Michigan fishing is very good weather and waves are not. 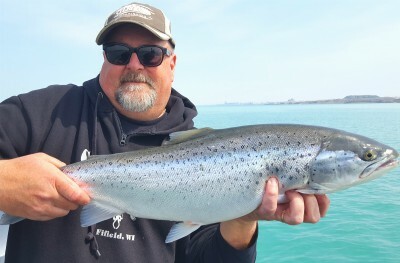 It's been a struggle so far this spring When we get some stable weather and nice winds fishing rocks, when the North winds start blowing we can't even fish. It's frustrating to say the least. 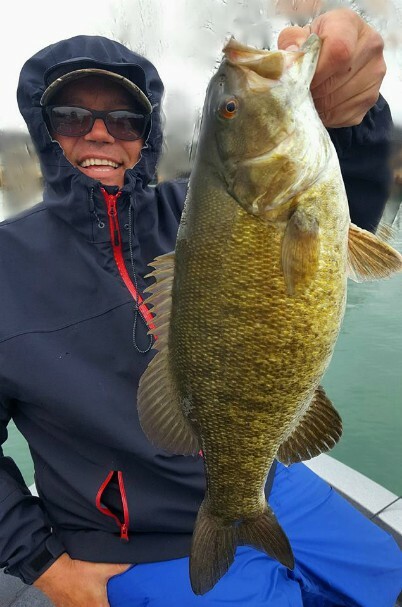 Smallmouth fishing has been very good all month for both numbers of fish and quality. 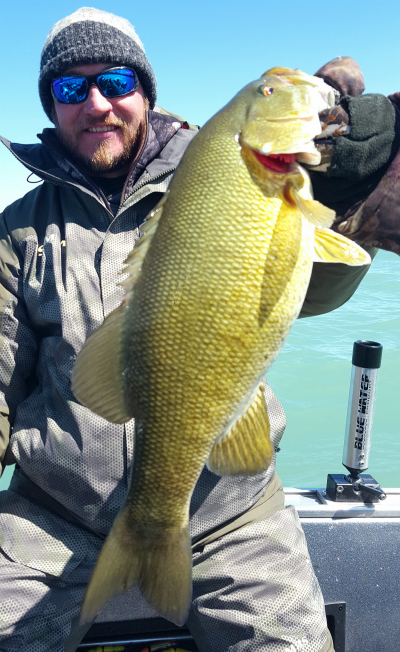 This past 2 weeks were excellent, good water temperature and great water clarity made for some unreal days. 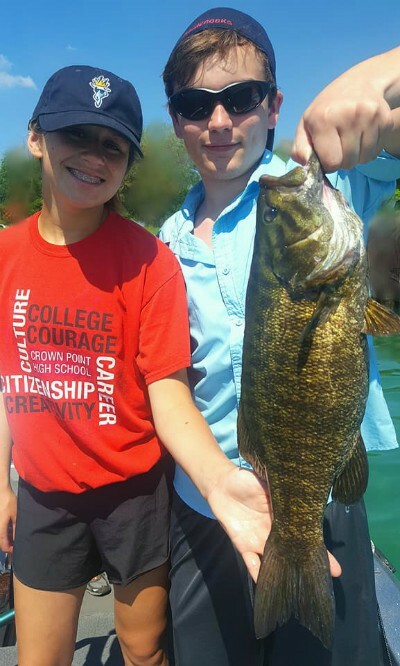 We had lots of smallmouth over 4 lbs and one over 5 lbs. 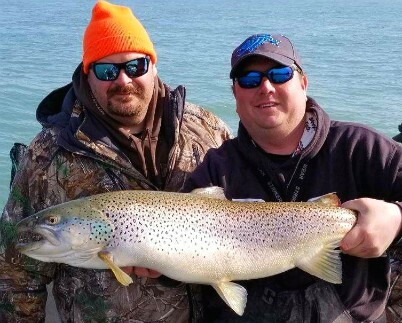 Also were getting some giant brown trout mixed in while bass fishing, including the biggest one ever to enter my boat 20lbs 2 ozs. 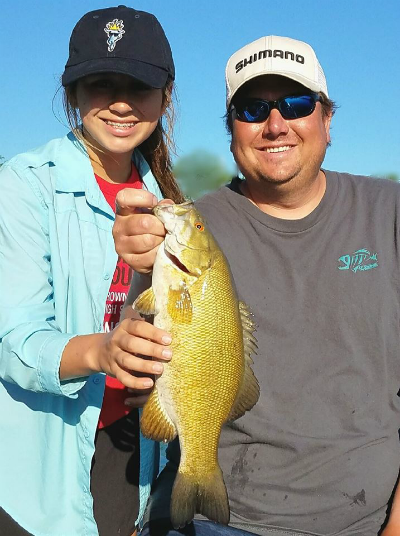 We released all the browns and smallmouth, hopefully we catch them when they are even bigger! 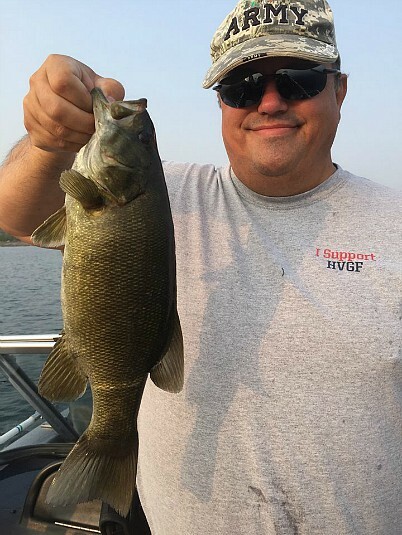 Best baits have been Tight Rope jigs in brown and black colors with either a Lure Craft Little D in SI color or Dark Melon color, also did very well on Odin Baits in Brown/Purple flake or Black/multi flake colors. 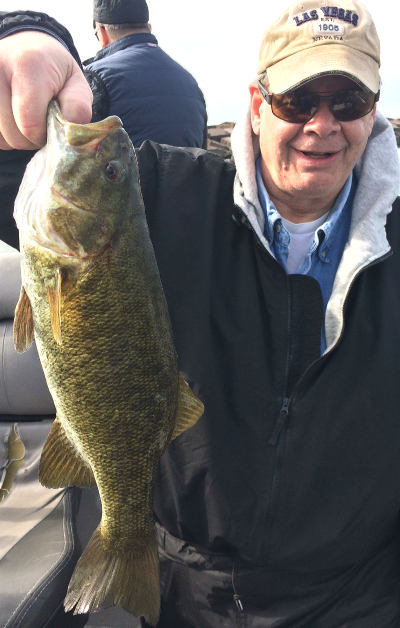 Also have had success on tube jigs in brown-black combinations. 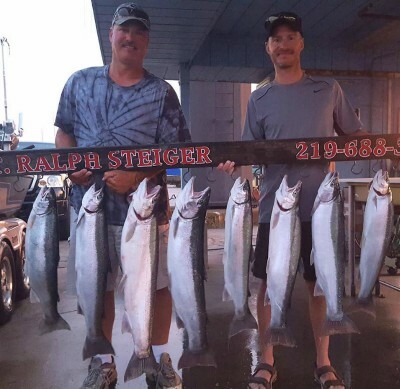 Most fishing has been in 8 to 20 ft of water with most of the bigger fish coming out of the deeper waters. 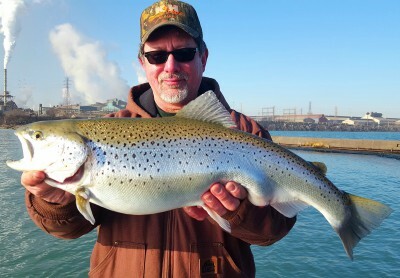 After a mild winter full of great fishing March arrived and so did the normal winter weather. It's been a tough month for us. 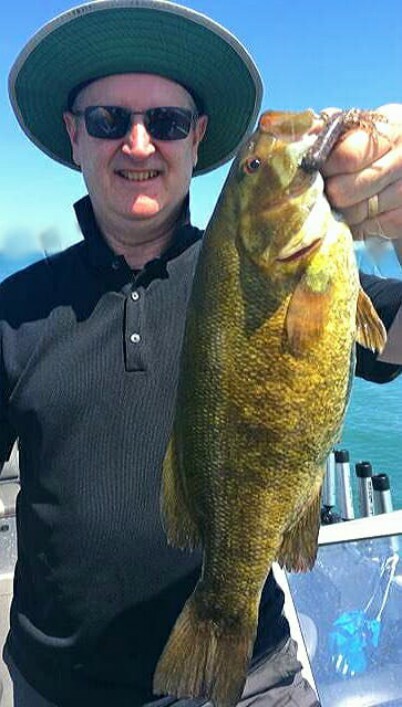 The fishing has not been the problem, actually fishing has been very good. 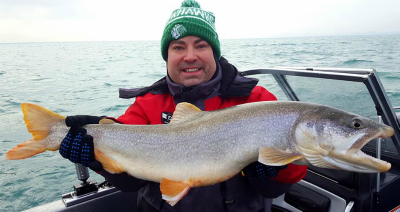 The wind, waves, very cold temperatures, and even a couple of blizzards made for unsafe conditions on the lake. 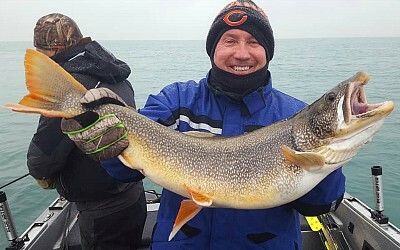 Good news is when we were able to get out we caught a wide variety of species and had some great days. 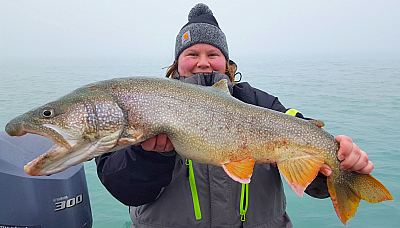 The jigging for lake trout remained very good up until this past week, coho salmon and brown trout action trolling has been excellent, casting for the salmon/trout was not the easiest thing to do this year but I think that was mostly due to unstable weather conditions. 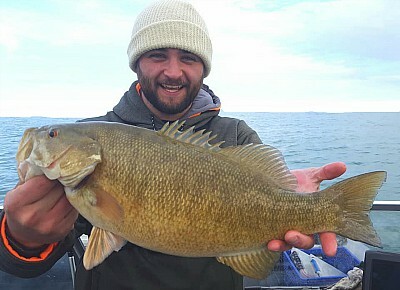 We are just starting to see some smallmouth bass getting active too. I will try to post more often, looking forward to having a great April. 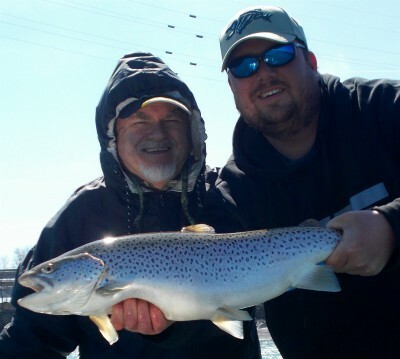 I still have a few days open in May for salmon/trout or smallmouth bass fishing. Summer dates are now becoming filled up, especially the weekends. If interested in getting out call me anytime.